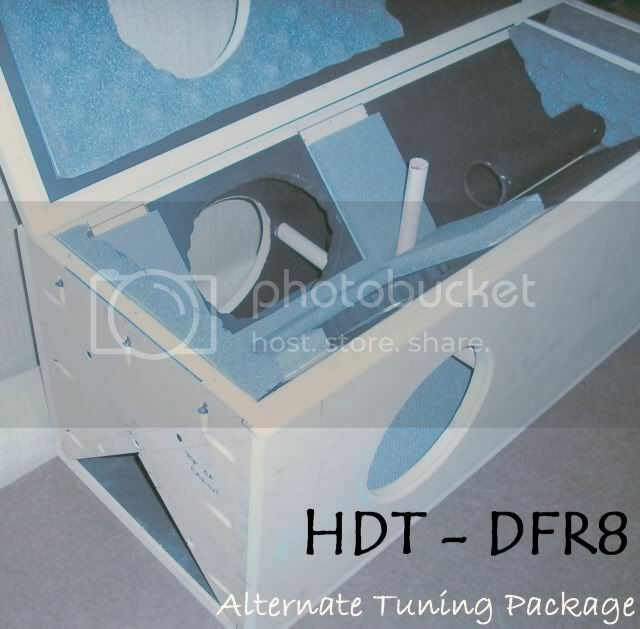 The following images are of my current project, assembling a set of single driver HDT cabinets with the recommended alternate tuning procedures implemented to match the performance characteristics of the modified DFR-8 / Fostex driver conversion. 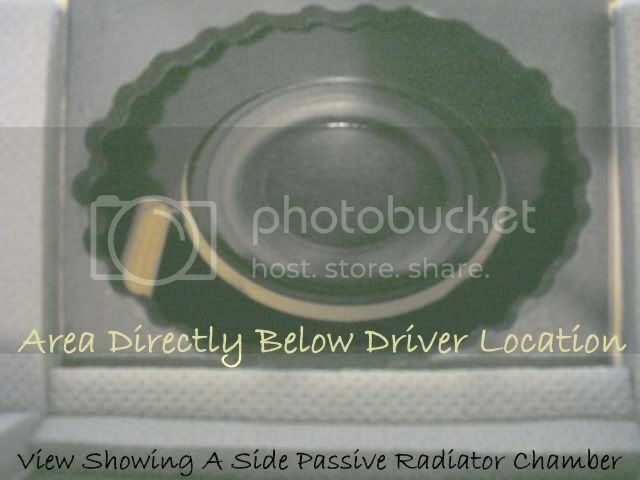 These photographs show extensive detail as to what is required for optimal performance with these drivers. There is a blend of two different types of acoustic foam used in this build. 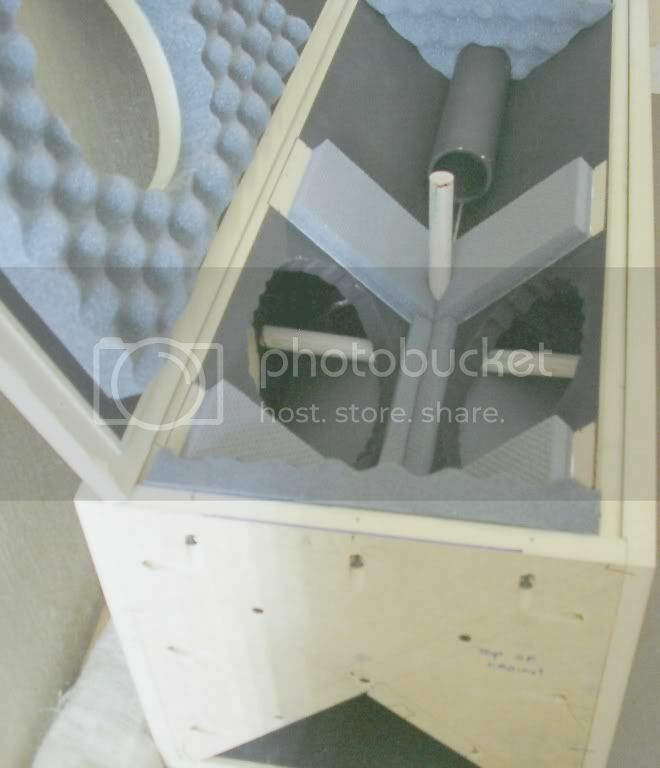 This involves a combination of convoluted acoustic foam, and a higher performance rated multi-layer composition foam for controlling vibration and standing waves inside the cabinet. 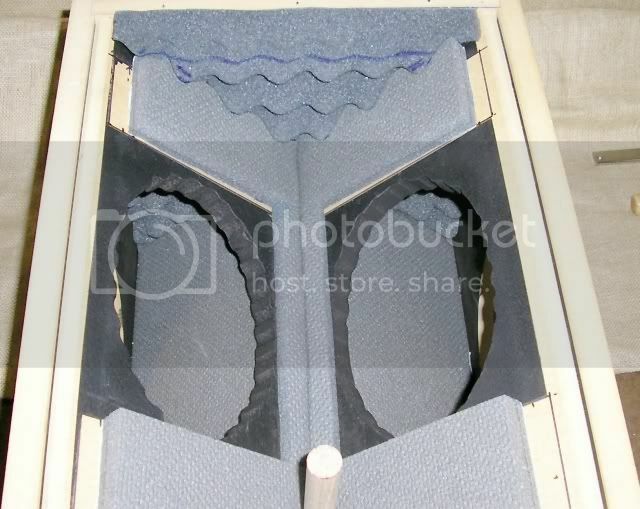 To further reduce vibration within the inner walls of each chamber, all areas NOT covered with foam have been coated with an asphalt based sound deadener used to undercoat automobiles for noise reduction. Extreme care was established by very careful masking of each panel to insure that none of the coating was applied to any joint surface where glue is intended for assembly. The foam sections are glued to the bare MDF surface which was also masked off prior to coating with the visceolastic application. The foam is attached after the coating is applied, with only the black sections that are visible actually coated. 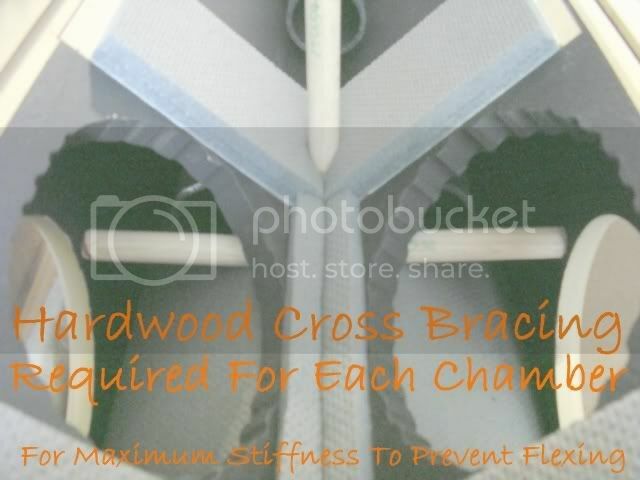 A very critical modification NOT shown on the blueprints, are that of the hardwood cross brace stiffeners required for EACH chamber to nullify any cabinet flexing between the chambers. 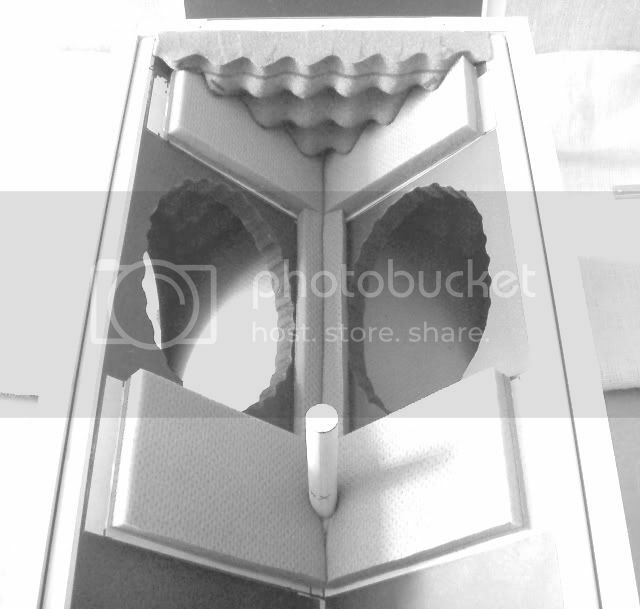 This requires only one brace per chamber as shown in the photographs. 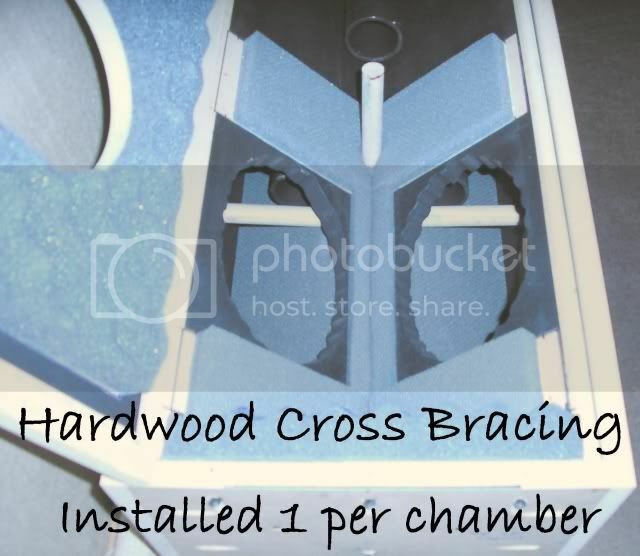 They are cut to fit from hardwood dowling and beveled to fit snugly within the chamber V-sections. These cabinets as shown have not been glued together as of yet. What is shown is a DRY-fitting to insure that everything matches-up correctly. The perimeter foam sections 'compress' together perfectly when the panels are clamped together. 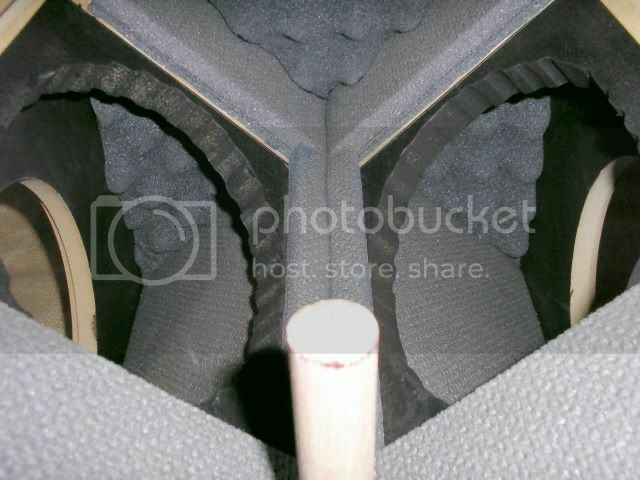 The compression forces the foam sections to merge together very snugly which expands tightly into all of the gaps for complete encapsulation where it needs to be. 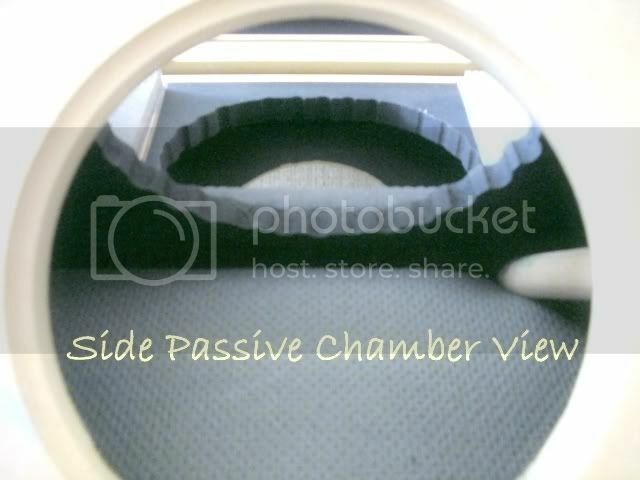 This view shows the bottom averaging chamber. 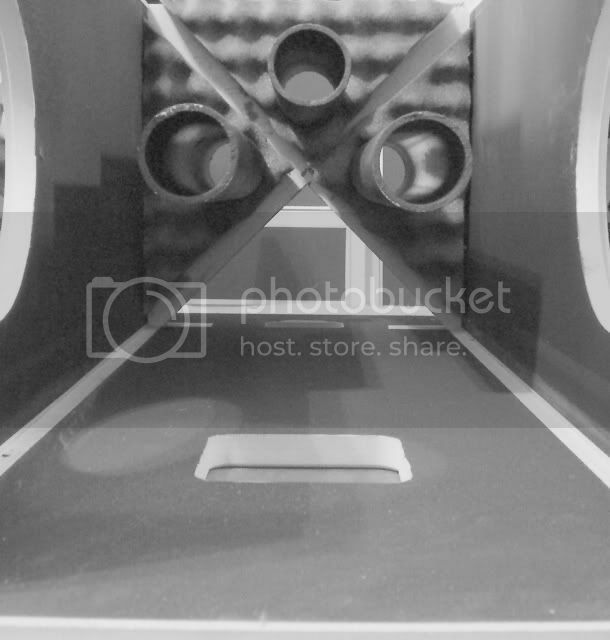 The three port tube openings can be seen entering from all three chambers. 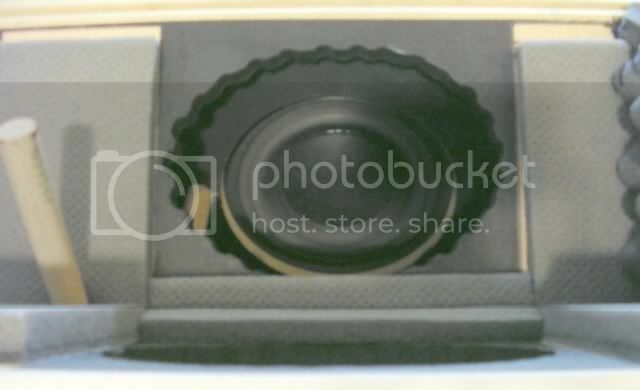 top plate of the speaker. 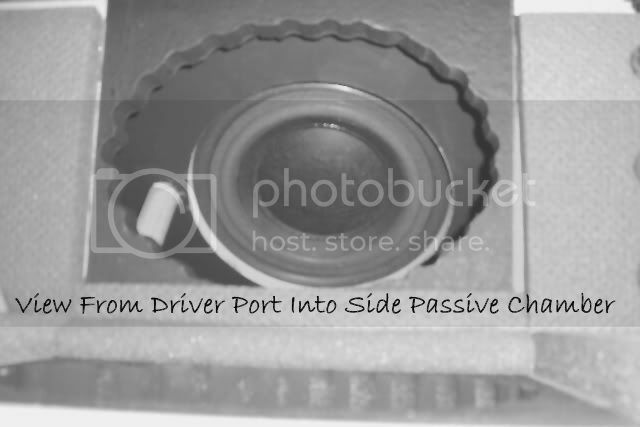 single driver HDT using the modified DFR-8 driver. speak volumes about how everything is put into place. More assembly photo's will be shown as the project progresses. I should have these operational by this Sunday (if all goes well). around 150-200 hours while in the NFX models). prepped and painted auto's before, so this would not be too difficult for me. 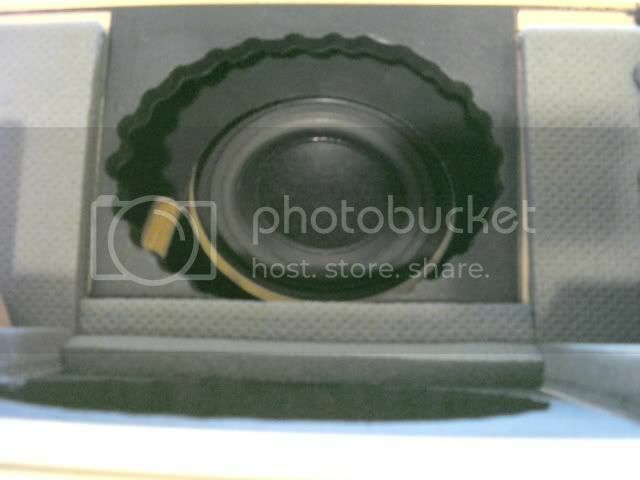 and around the top of the speaker with nothing but gravity holding it in place. with great detail using a CNC machine. very pleased to say the least. DFR-8 Driver ready for installation. 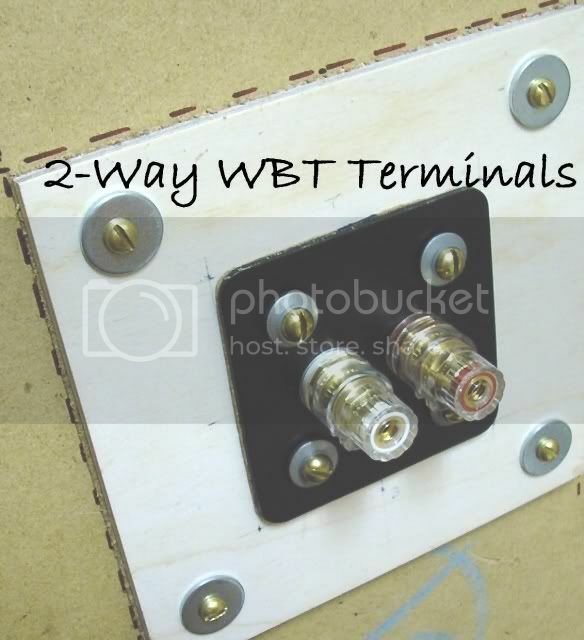 Terminal leads routed directly thru X-Brace. 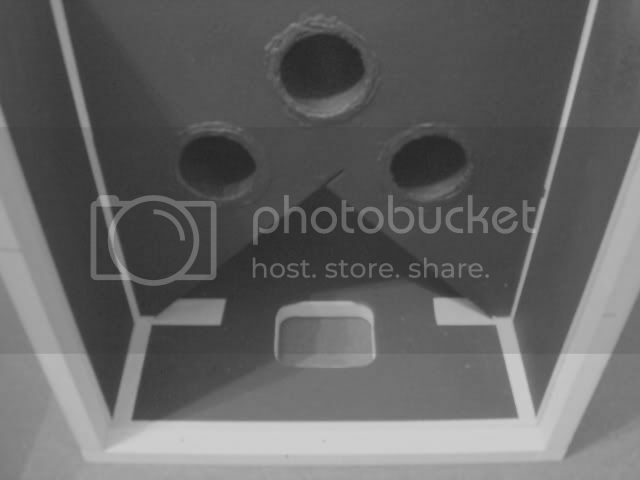 Holes are drilled to pass wires thru section into back chamber. 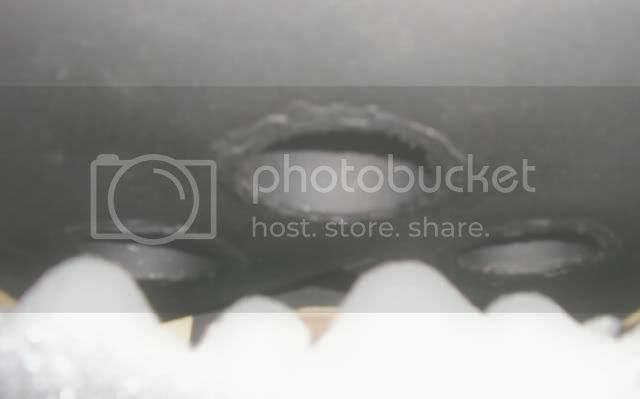 It is important that these holes are drilled to pass the wires tightly! 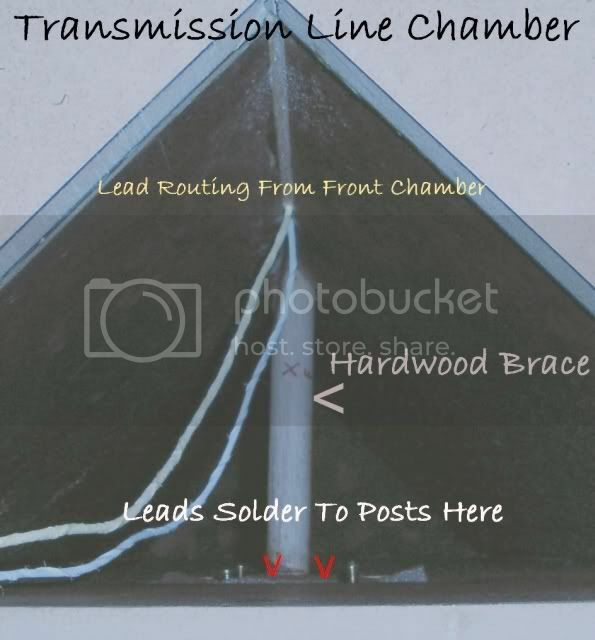 Once the wires are in position, the entry & exit points MUST be sealed off air tight to prevent unwanted interaction between the front chamber and the transmission-line. 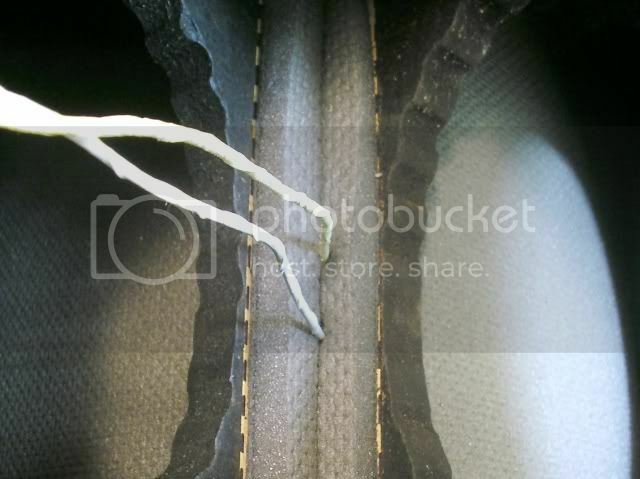 This can be done by coating the section of wire with some sticky putty, hot glue, etc., that resides within the X-brace section to seal the wire feeds effectively. The next step would be to coat the entry and exit points with hot glue, epoxy, etc. The HDT's are now operational. There are only two things left to do with these. off until another time so that I can get right into the listening part. am very impressed by the performance of these speakers in every aspect. good sound quality from the start. And that brings the conclusion for HDT alternate tuning 101. These images are of the final step prior to completion. additional strain relief from stressing the terminal connections. (ratcheting with quick release) to support the cables with ease. of the speaker across the floor while protecting it as well. I ran a series of real time tests using the RTA at an equadistant measuring point from the HDT's at their center, which is around 7 feet forward of the speakers position. All volume settings were unchanged, set at 1/4 of the amplifiers total output (approx. 7 watts). The response time was set to an explosive fast 35ms for a flat response reading.The following data was extracted by analyzing the maximum peak dB response for each frequency in 31 bands. The level range for all tests were set exact to register from 50dB to 110dB: Flat-Weighted. What my findings prove is that this data corresponds very closely to the performance test data provided in the white papers for the DFR-8 drivers. That data proves to be very accurate as confirmed by my tests. 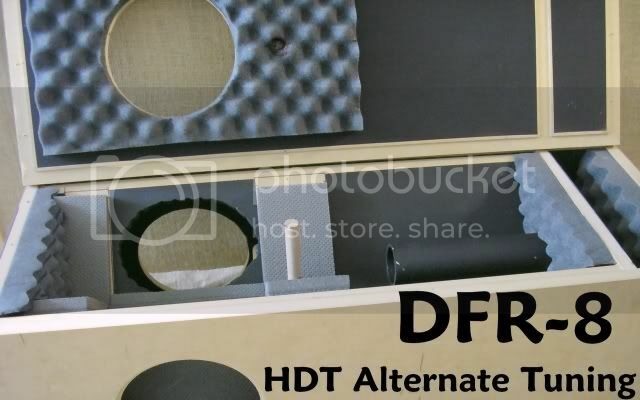 As you will see, the performance of the DFR-8 driver within the HDT cabinets (modified with the alternate tuning package), are nothing short of spectacular with results that are close to being perfect. I didn't need the RTA to tell me what my ears already confirmed, but since you can't hear my results, the data will have to substitute in order to convey how they sound. assembly for which the cantilever and stylus are machined as one piece from solid diamond. 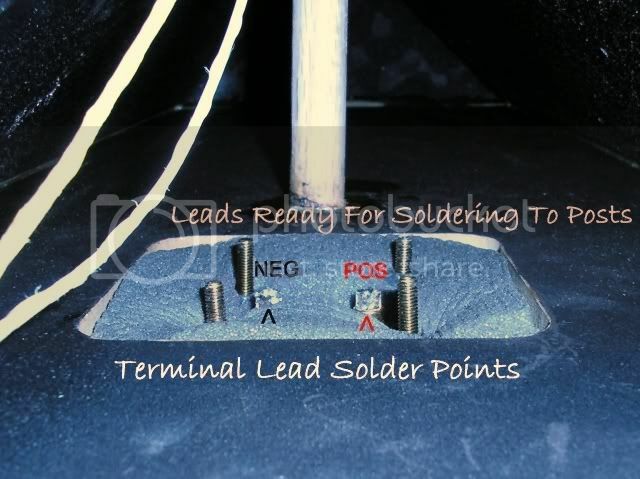 Signals from the Teres are fed into the Decware ZMC Dual-Mono step-up transformer unit which has an adjustable dial for fine tuning the dampening factor for the cartridge in use. 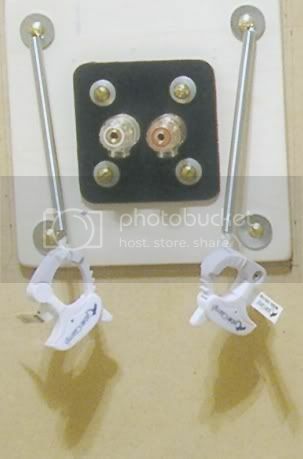 This unit then directs the signals to the Decware ZP3 phono-stage using high quality O.E.M. tubes. All of my cables are of ultra pure materials built to the highest performance standards, with fully active sheilding throughout the connection sequence to eliminate any interacton from EMI/RFI. The path leads to the Decware CSP2 which is fitted with a high grade Amperex "Bugle-Boy" 5AR4 rectifier and three gold-pin Ei-Elite 6DJ8EG's. The TORIIMK2 is fitted with premium grade tubes including a set of original style (early century) General Electric 5U4G large shoulder style rectifiers. The driver tubes are gold-pin 6DJ8EG's. The power tubes are a Quad-matched set of cryogenically enhanced KT88's from ElectroHarmonix. and to what degree of range is optimal throughout the frequency spectrum. lack of sensitivity of the ear to bass tones, especially at lower sound levels. The auditory area of the human ear is bound by two threshold curves. Some final notes regarding critical areas of the build. special details within their individual attributes. set of speakers have proven to provide. Everything done within this build had a substantial purpose. A word about cabinet assembly using screws. This is never a good idea. once the glue has set. used as an assembly aid. a difference to these drivers has been applied to them. designs with the alternate tuning approach. total isolation from any unwanted energy disturbance. like that used for installing automotive glass. prevention of interaction from vibration. tabs of the driver and the cabinet itself. deviation within the way the driver seats within the cabinet. The result of this is highly unfavorable and must be avoided. possible so that it’s form is not altered. than this will be detrimental to the drivers performance. flat response across the frequency spectrum. disturbance. This in turn results in increased efficiency. isolation, accomplished thru proper de-coupling techniques. within this structure has been instilled with extreme measure. as to what these measurements reveal. as they truly do remain absolutely transparent. LEVEL BY ANY OBTAINABLE MARGIN!!! PERIOD. 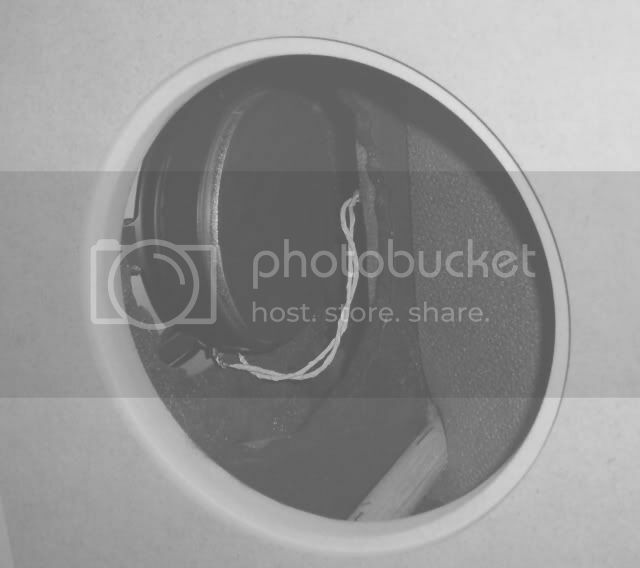 source with premium vinyl recordings. digital source directly into the trash! Great job and more than excellent review~! 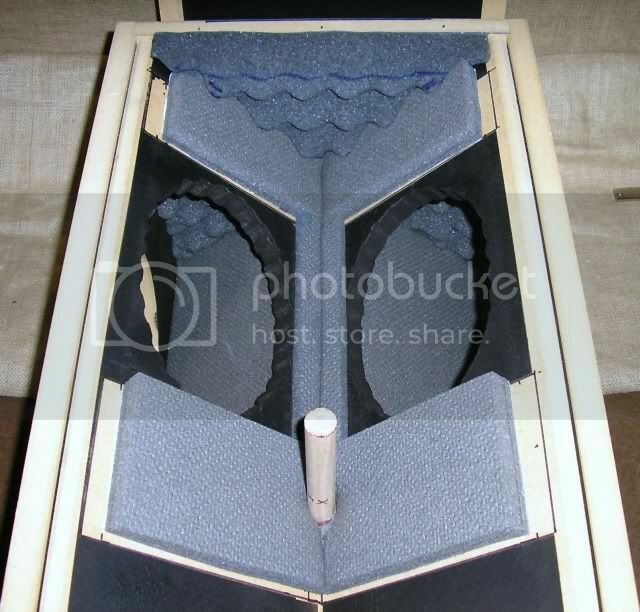 I have some idea of what your stable looks like and for you to have put this much effort into the review of these speakers tells volumes of what you must think of the end result. I have to admit, you have gone way over the bar to get them where you want them. It inspires me to want to finish several of my open projects and perhaps build a set of these for myself. You are quite welcome Robert! The one factor that always remains paramount to the outcome of one's endeavors, is indeed solidified by the extent of effort instilled within any given endeavor. If you want to obtain optimal results, one must strive to establish what it takes to acquire those optimal results, with the focus on that quality factor to hold zero form in regards to compromise. A compromise is simply a path to failure and disappointment. The end result is always a deviation from the intended goal. The single most important constant that remains as the catalyst within my approach to acquiring the best possible solution in any endeavor that I engage upon, is that of applied logic and proven concept as the basis for a solid foundation leading to the pinnacle of my projected goal. The philosophy which I live by, is that either I do it right or I don't do it at all! When I have the luxury to control the outcome, compromise is never part of the equation as it relates to audio. The outcome will always reveal the level of influence established within the parts that constitute the whole. The dramatic difference between a well engineered analog source and that of it’s digital counterpart is clear and absolute within the outcome perceived. Pure analog will always remain as the reference standard for which other forms simply attempt to emulate it’s natural form. Up to this point, even the best examples are substandard by comparison, with the constant being that digital will always be a compromise to the inherent qualities of the analog form. A listening session within my audio room, with a high quality analog source as the reference, will definitely open your mind to the reality of how far this audio journey really can go. There are times that I still am amazed with some of the experiences that unfold from one listening session to another. I am willing to bet that if you experienced the level of sound qualities that I have unveiled, you would no doubt do everything possible to replicate that presentation. This is something that only can be interpreted through real world application and experience. Once you are engulfed within the inner elements that form to reveal the complex matrix of inner beauty within the musical form, and the extent to which that form is conveyed, there is no turning back, as anything less simply will not do! My auditory perception to deviation within the range of human hearing is well above average. My hearing potential is very sensitive throughout the frequency spectrum with any ‘reasonably’ discerning deflection in that spectrum easily differentiated. I simply have very limited tolerance to the compromise which digital represents. My audible sensitivity range detects something very wrong within how solid state and digital sound is conveyed. This sensitivity always triggers an effect within my hearing perception which raises the red flag of something amiss by a large degree. I cannot listen to any device of this nature involving raised levels above moderation without triggering an offensive reaction in the form of ringing within my ears. Television, radio, CD players, or anything devised of mediocre solid state design, will trigger this offensive ringing which clearly is a verification of nasty frequency elements which should not be present within the sound perceived. This is something that never occurs from exposure to analog or natural sound within my environment. I have to limit my exposure time to digital with very careful application of moderate volume levels. Even low level exposure to the digital form produces this ill-effect over a short period of time, and I simply find it to be offensive. This even by having the nasty OP-amps removed from the DAC output stage, with profoundly improved quality factors by means of single-ended vacuum tube buffering. Without this advanced improvement, I absolutely would avoid digital as a source, as it would be completely intolerable for listening within the bounds of my current system potential. No detail with any relevancy goes unresolved, no matter how miniscule. The less transparent a system is, the more tolerable ones perception to digital sound is allowed due to the masking effect. This system in relation with the corresponding acoustical surroundings is at a level of transparency where there is simply no forgiveness for any bad elements to reside before the red flags arise. Full disclosure as to the qualities, or to that of offensive anomalies, are exposed to the maximum degree. The system either portrays an absolutely ideal presentation of sound elements at one extreme, or it screams out the injustice of induced aberrations in it’s path on the other extreme. No middle ground of tolerance. It is either one or the other. On the other hand, in the presence of pure analog, the sound is very natural and comforting, in total compliance within my perception of it’s form. This allows me to comfortably listen at powerful levels from an analog source for extended periods lasting for hours, without ever triggering the ‘ringing’ effect within my auditory region. The sound quality is so natural and smooth with analog, that even by approaching dangerous levels of sound pressure, the connection is of a highly warranted nature that is nothing short of desirable. It doesn’t take an in-depth analytical approach to discern the difference in these qualities when the attributing factors come into play on this level. The difference is perceived instantaneously as a profound degree of improvement within each and every aspect of the musical form. The degree of improvement applied to one aspect of sound is relevant toward it’s influence upon the other aspects which constitute all variables that unveil the presence of ambience, definition, and it’s three dimensional form for which the music holds within it‘s content. My experiences have divulged extensive enlightenment as to what the boundaries of audio perception holds in store. The conclusion is that my expectations within those boundaries have been completely satisfied with absolute manifestation for what the possibilities of quality audio have to offer. This achievement became reality through unwavering dedication to the principals which formulate the possibility of this reality into fruition. All critical factors which influence this degree of projected performance have been the focal point towards reaching my goal. This goal would not have been obtainable solely with the implementation of high quality equipment, as the degree of complication extends far greater than that for which to achieve the pinnacle of sound reproduction. One’s environmental surroundings must reinforce and complement that which the system produces. By falling short here, this all becomes a futile attempt at reaching the ultimate solution, with mediocrity prevailing as a dominant form of compromise. If the acoustical factors within the room do not complement the qualities of the sound for which it influences, you will have failed miserably in the grand scheme of this concept with all that is good, reduced to the mercy of horrific acoustic complications that are allowed to prevail uncontrolled. Remember that not only does one interpret the sound of the system by itself, but that of the combined relationship between it and the surrounding elements. 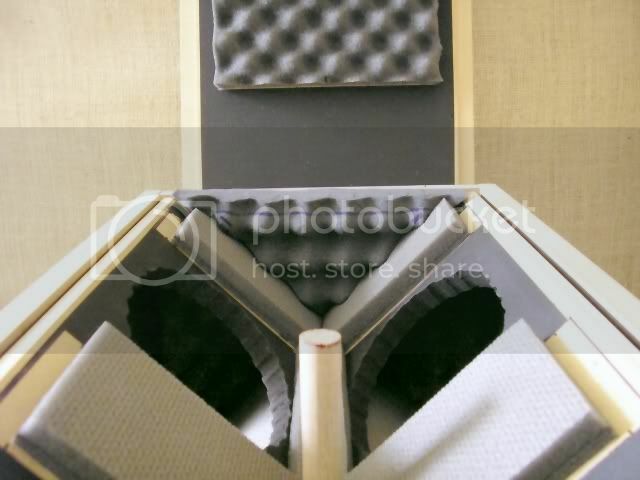 It is crucial to insure that an equal amount of effort goes toward acoustical control in relation to the audio gear in order to balance the outcome. No matter how you look at it, the end result is how the room sounds in general and to what degree of influence it portrays within the sound of your system. The surrounding elements have the final say toward the degree of experience bestowed upon the listener. Good luck to you on your projects Robert! Hopefully, some good will come out of your efforts and something positive will be gained from them. there is an undeniable amount of inspiration for me after viewing the proceedures/ideas reccomended by this post. shortly put, i will begin rebuilding the hdt cabinets as soon as weather permits. this will also allow me to build them with the alternate tuning design in mind. i suspected that there would be a design that really captured my attention, and this is the one. thank you so much for the helpful photo's, as they convey much about what is to be done. 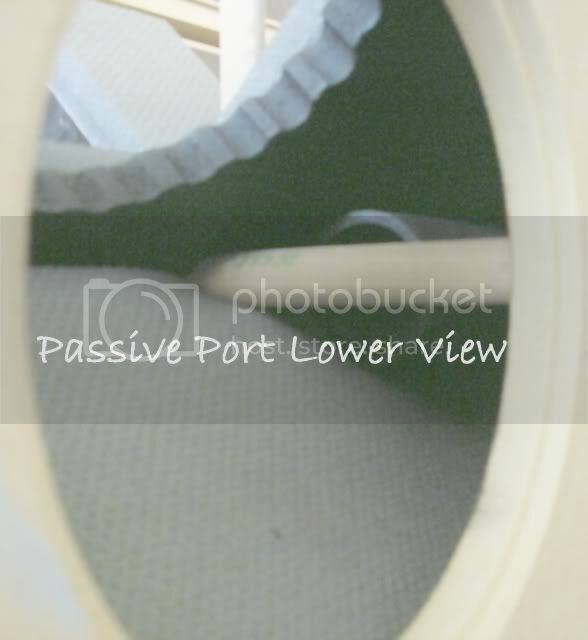 since i am on the subject, would you find it beneficial to use a roundover bit on the bottom of the junction of the port holes in the averaging chamber? maybe to reduce any chuffing, i thought. p.s. , any thoughts of comparison of sound between the hdt and the nfx? 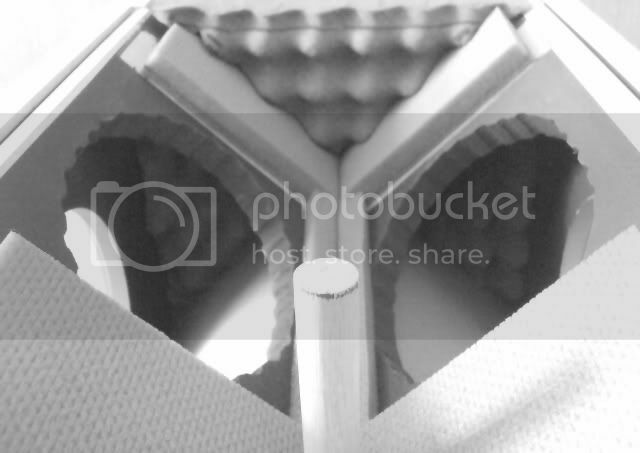 it is with some difficulty that i reply about any progress of my hdt speakr project here, since what has been shown by these photos posted is a much higher level of build quality than what i have produced in my first attempt. but i would be negelegent if i didnt offer a few observations. first, let me say that i built the hdt without the alternative tuning. the construction went well, but when completed, i read/viewed this post, and immediatly felt there was more that i could do for the cabinet stability of this design. so far, i have incorperated the braces, but with a twist. i decided that a threaded rod could be used in place of the wooden ones only because i wanted to see if there was a difference with adjustable tension by the tightening of a nut on each end. 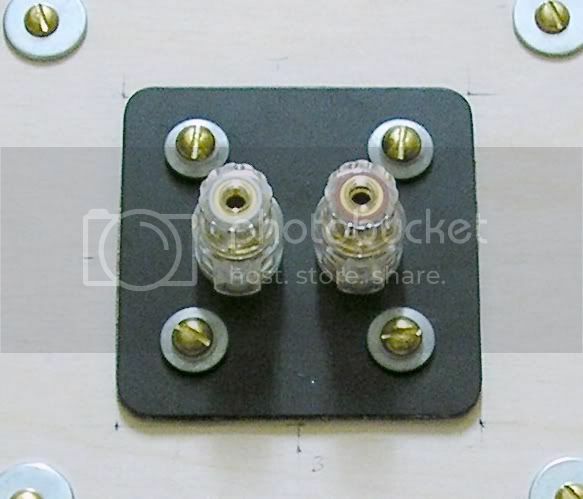 indeed there is, and by adding nuts and washers to use in the center panels (through the 'x' portion), as a center anchor, the panels can be 'tuned'. 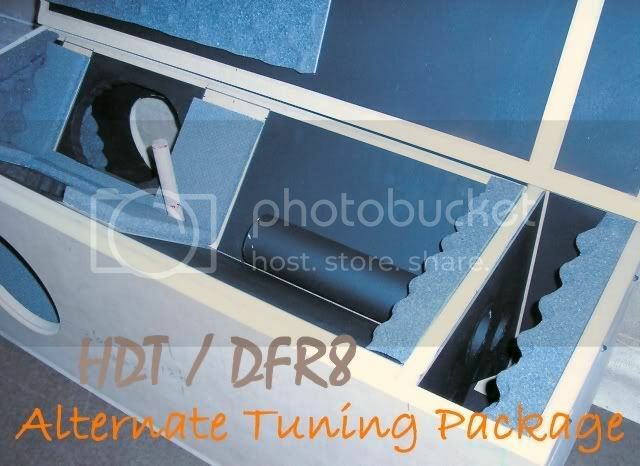 New Year's resolution: Install the Alternate tuning mods and send my fe-208's to Decware for the DFR-8 treatment. Add interior damping and bracing. A consideration I have is adding a finish layer from 1/4" bamboo plywood ( "Plyboo" ) over asphaltic dampening sheets or cork to the outside of the MDF cabinet. 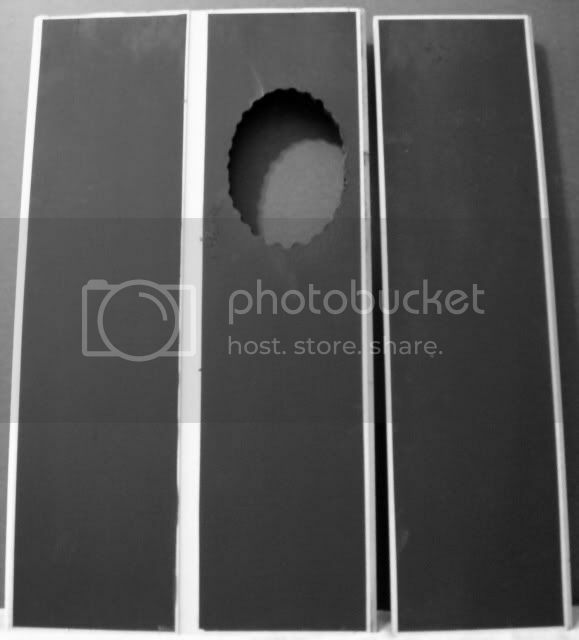 That would effectively create a dampened double wall about 1" thick, with a durable finish surface. Any thoughts on that? Good to hear that some inspiration has been induced from this project! I would almost be inclined to believe that it might be easier to start from scratch on the cabinets due to the complexity of internal modification once these have been glued-up. Unless the cabinet bottom plates are removable for easy access, it would seem to be a lot of trouble trying to swap out different port tubes which would be the most challenging thing to do. The modified port tubes are much longer than the original specifications. It is a question of whether or not it is possible to change these tubes effectively without damage which may occur during the separation process. 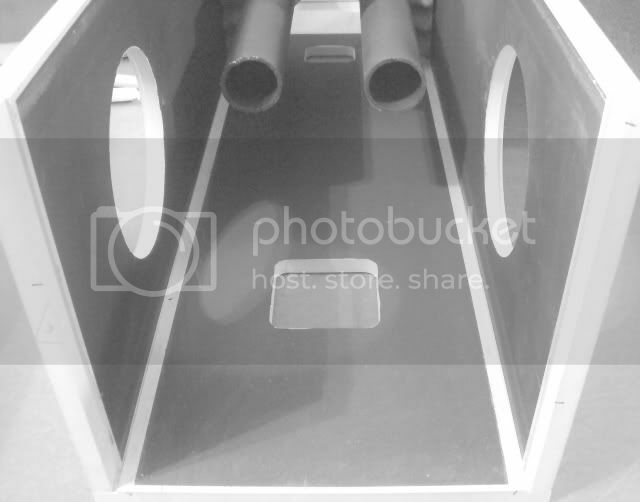 It is possible to incorporate a joining sleeve between the existing pipes and that of the added extensions. Just find the I.D. of an oversize pipe to slip around the O.D. 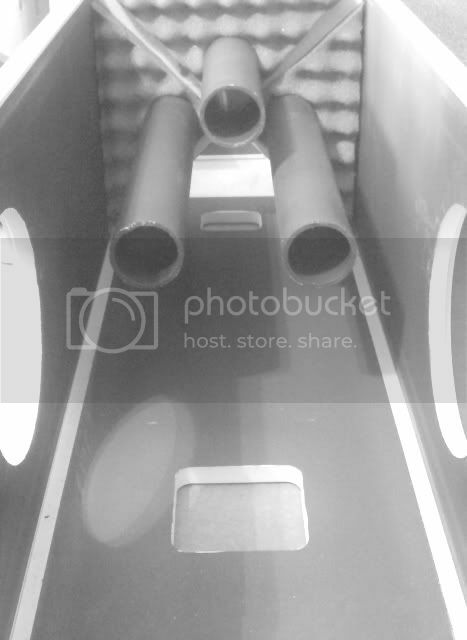 of the actual pipe dimension and glue the joints together once the right length is determined. 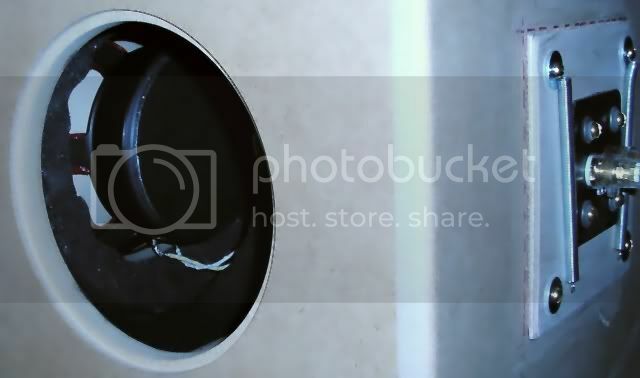 This may be easier than trying to remove the old pipes from the openings in the plate. If they have been installed with epoxy, you can forget about removing them. I understand that this may not be an option for you, so it is merely a suggestion from an alternative standpoint. If it where me, for the sake of experimentation, I would keep the current HDT set as they are for baseline testing models. Then build a new set exactly as shown for accurate testing and comparative results which can be conveyed directly between the two models. The only way to truly understand the differences which separates these versions, is to actually perform side by side analysis between the two with controlled testing parameters. 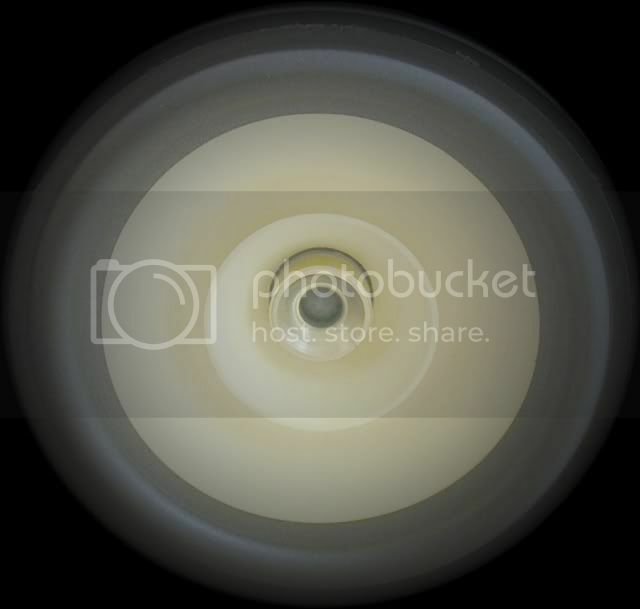 As for using a round over bit to flare out the exit port area, it certainly wouldn’t hurt anything by doing so. The increased flare rate will allow for less back pressure and turbulence within the flow. Just remember that depending upon the degree of flare rate, you would effectively be changing the characteristics of the ports function. The total degree of flare has to be compensated for when determining the length of each port tube. 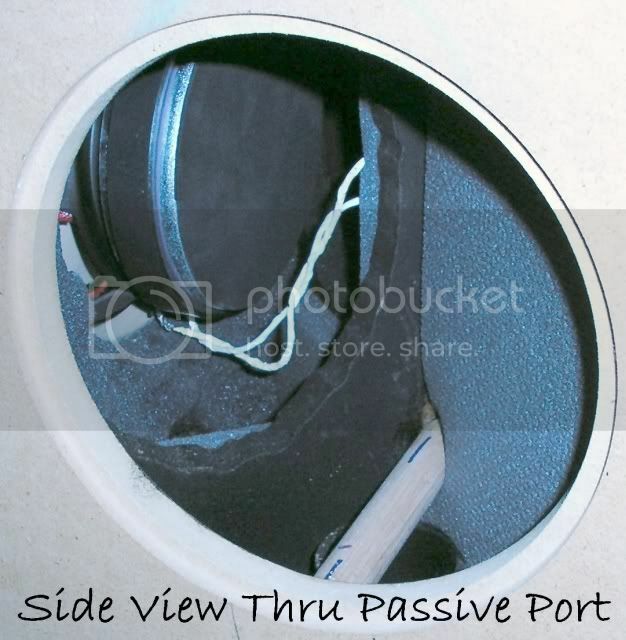 I simply dealt with this by full coverage inside and outside of the port tubes with the absorptive sound deadener. I also filed the internal edges smooth and semi-beveled to help eliminate any problem with this. 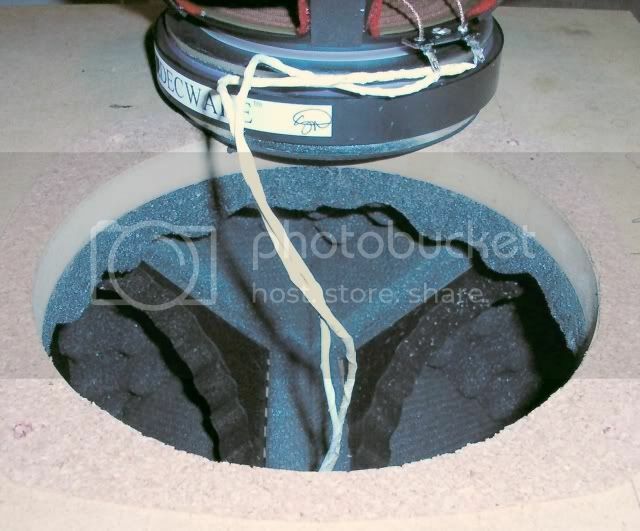 There is a heavily concentrated application of acoustic foam directly under the port area within the averaging chamber. This really helps to stabilize the activity going on within this area so that the exiting wave pressure through the TL section is maintained effectively. Of course, part of this problem is dealt with at the port entry points. 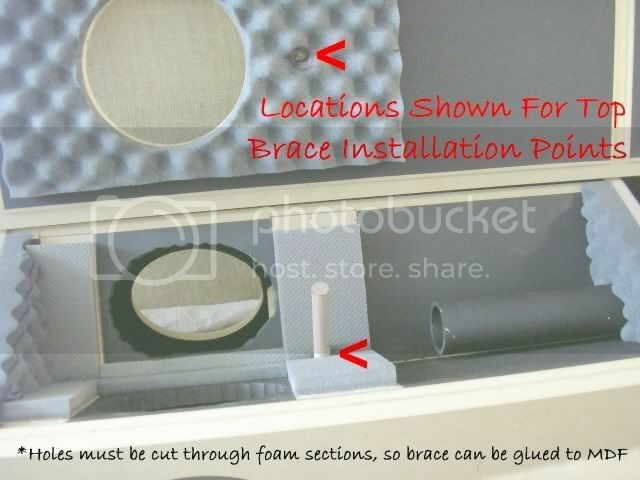 The multi-composition layered foam supporting the top sections, also work to stabilize the pressure entering those points. How much of a difference does this actually make? It is impossible to determine without direct comparative testing to models without this treatment. 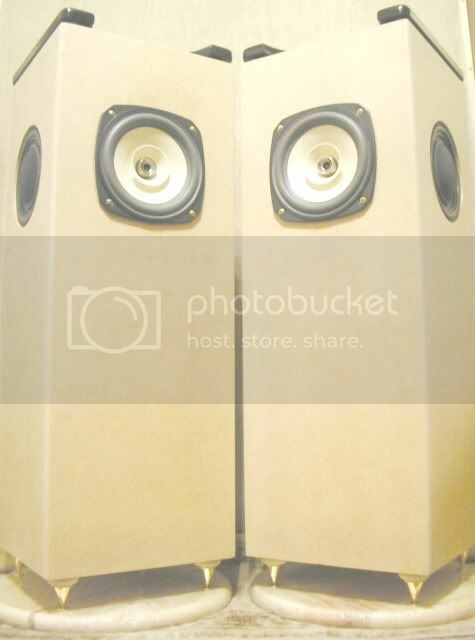 I do know that these speakers produce the most natural form of low-end response that I’ve heard to date. It must be experienced to be understood. I will also tell you that in order to achieve this level of complexity, all other conditions must be perfectly in sync between the room and the speakers position. Digital does not begin to convey the complex beauty that unravels from these speakers such as when a refined analog source is used for complete harmony. The difference between digital and good quality analog is clearly present within the critical midrange. Rich tonal texture is the major gain of analog over digital within these speakers. The resulting ambience which surrounds the listener is far more justified. This set of speakers will absolutely prove the superiority of analog over digital to a degree where the digital form is rendered completely marginal without merit by comparison. It takes more than a couple of watts to flush out the potential within these speakers. A strong high quality P-P design such as the TORIIMK2 is the perfect complement for driving these speakers. It takes an amplification factor of this magnitude for which to bring the full potential of the bottom end to life with a presence of unparalleled quality. The small S.E.T. amps will not supply enough sustained usable energy to drive these speakers within these lower limits with the kind of finesse and aggressive stance that higher amplification factors will provide. The S.E.T. Amps will produce the bass notes clearly, but with very limited involvement for which makes it very difficult for the listener to become engaged. It absolutely takes an adequate amount of power to produce the true level of response from these speakers in the lower registers. These speakers love clean power, responding quite favorably to a healthy dose of it. Otherwise, these speakers will appear to be bass shy which is far from the truth. There is a transition at around 1/4 to 1/3 of the TORIIMK2 power curve that dials in the ideal condition for which the magic of the speakers is revealed. Below this point, the low-end just does not show it’s true splendor in form. Once the ideal power curve is matched, the physical presence becomes quite intriguing to say the least! It only gets better with additional clean power. Once you have heard these speakers powered by this amp in a room with ideal acoustical factors, you will be stunned by what really lies within the potential of these speakers. By the time that you utilize half to three-quarter of the TORIIMK2’s power, you will be fooled into thinking that there are much more powerful amplifiers in use along with supplemental subwoofer augmentation to produce such incredible low-end response. The bottom end response is similar to that of the WO32 (audiophile version), but with much cleaner transients producing detail that would be very difficult for an external subwoofer to reproduce on this level. Outside of the WO32 with clean amplification factors (yes I have built one with a great deal of listening experience), it would take something along the lines of Steve’s Imperial Sub cabinets to produce the QUALITY of bass which is presented by my modified HDT versions. Quality is the key factor here! Not merely SPL alone, but the correct blend of attributes which constitute accuracy and articulation with absolute presence and physical connection. I will state that low frequency detail articulation is a major strongpoint of this design as done the way shown here. I am so satisfied with the degree of clarity and the intensity of the punch felt from the lower notes, that I strongly recommend keeping this specification exactly as shown. I do however like your modification with the adjustable tensioning rods as done with the plates on the MKII version. Other than that, I would not change anything else that I did. The only way for you to know the difference within these modifications is by direct comparison. If you change anything on these speakers other than what I did, the speakers will not be within the same sound characteristics. You may obtain just as good of results and possibly even better results with alternative measures. I can only suggest that you duplicate the build exactly as I had done if you want to be sure of hearing the performance that I get out of mine. It would really be interesting to have a side by side comparison between my modified version and that of what you come up with. I have a couple sets of high-end T-Line speaker designs which produce incredible depth and definition throughout the lower registers, these of which I feel are some of the cleanest sounding designs ever experienced. The depth of detail, the speed of transient response, and the resulting pace and rhythm produced from these modified HDT’s as shown , easily sets a new standard which clearly surpasses the leading T-line designs. It really comes down to total and absolute satisfaction for which you can finally listen with complete confidence in these designs and know without reservation that there is not one single fault to be formulated from their presentation. The seamless transition and purity of the musical form is just so natural and unrestrained throughout the full spectrum, that you are quickly reminded just how bad other speaker designs can be, and usually are by comparison. When you hear something this good, it heightens your awareness to the flaws and shortcomings of inferior speaker designs which may have seemed very good prior to this enlightenment. They have definitely raised my standard by a very large degree. There is something very special about the presentation delivered by this set. It compares trying to find the ultimate solution when you are not sure what the ultimate solution actually is with complete certainty. When the final solution is presented, there remains no doubt within your mind that this is unquestionably what has been evading you all along. When you experience this level of quality, it becomes very obvious as to how correct this achievement really is. 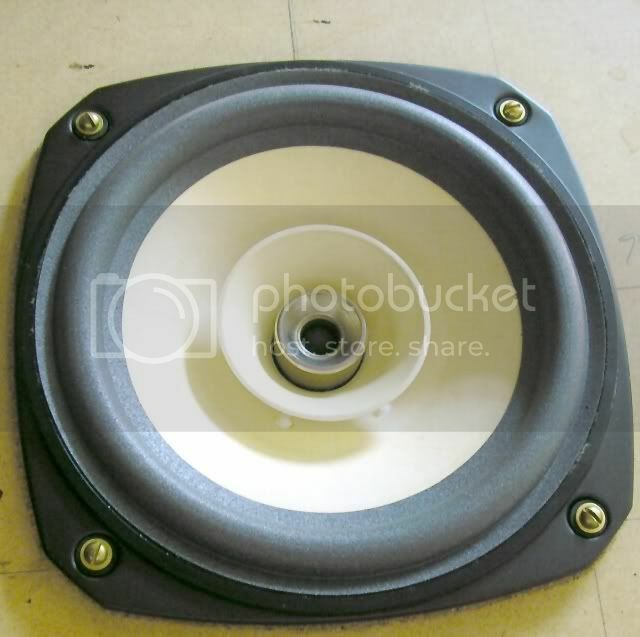 It makes the majority of other speaker designs sound pathetic by comparison, to which you really begin to question the design principles used within other designs. I believe that you will be stunned by the performance of the DFR-8 in the HDT design once upgraded as shown in my build. Of course results will vary significantly when critical factors such as room dimensions, speaker arrangement, equipment used (especially amplification and source factors), and acoustical conditions are considered for overall influence of the speakers true potential. Important advice regarding set-up: Please refer to my extensive room calibration/speaker placement guidelines as posted in another forum link located here. The complexity of careful tuning is what finally flushed out the special qualities and low end response within these speakers. I highly suggest this procedure as the final element for which to convey the speakers true potential. When I set out to build these, I had one thing in mind. The goal was to maximize the performance gain in general. Without running off on some radical tangent void of supporting evidence for which to reinforce the pros and cons of change within the original design, the idea was to take on a logical approach based upon known factors which suggest very strongly, the positive results to be gained from them. I wanted the speakers to have every possible means of potential extracted from them from a logical standpoint. I was not out to compare differences between models, but to simply create a set with an unparalleled quality factor. I cannot tell you the exact level of gain or change in the HDT signature from the original version compared to the versions which I built, since I do not have the original version to compare with. I do rely upon feedback from those who have gone from the early versions to that of the upgraded advanced tuning designs. There is sufficient data to suggest that these modifications fully justify their position with great merit and success. 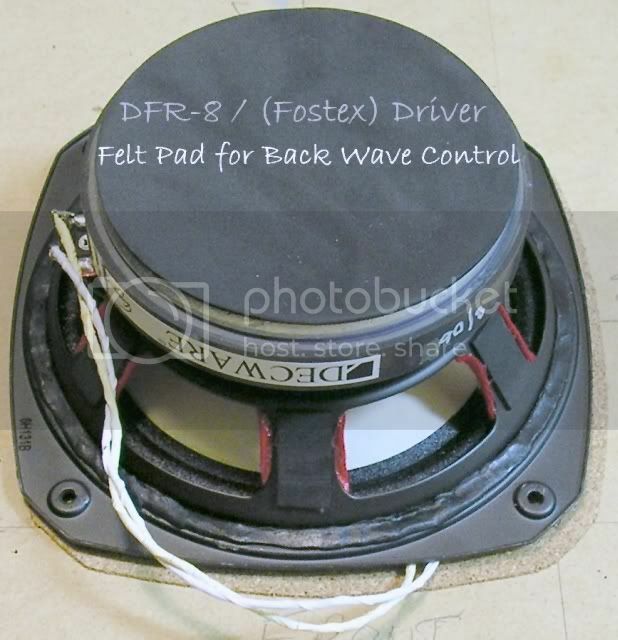 The controlled test data clearly proves the superior attributes of the DFR-8 driver in the upgraded design package over that of the previous Fostex driver within original cabinet specifications. Quite a number of seasoned HDT owners have confirmed the significant enhancement gained from the advanced tuning upgrade. If one understands the negative aspects which can be present within an element, with an equal understanding of the positive countermeasures for which to cancel it’s negative influence, it only makes sense to factor in this degree of balance as long as it remains within a logical approach based upon proven concept. Steve has presented us with the ultimate driver choice for the advanced HDT design. All that is left is to apply the correct measures within the cabinet design for which to extract maximum potential . I feel confident that this has been established within the custom set built and documented here. If I may be as bold to suggest that maybe you could arrange to compare the stock speakers with a new set of modified versions in controlled evaluations, you could perhaps inform us as to your findings. I’m sure that the results will prove to be quite intriguing. This of course would depend on the feasibility of creating another set of speakers as opposed to just modifying the current set. The only way that one will determine the relevance for what was implemented within my custom set, for which any real improvement can be ascertained from these exact measures, is to reproduce this build exactly as a perfect clone. It would be very difficult to spray the interior walls effectively with the asphalt sound deadening coating once assembled. It could be done to a certain degree, but I would not want to try it on an assembled set. The addition of asphalt based sound deadening material (thin sheets) would be the closest thing to the actual spray-on method and should produce very similar results. All that I can surmise from this concept is that in general overview, I seem to be showing some very rare performance potential that many others are reporting as non-existent or lackluster at best. 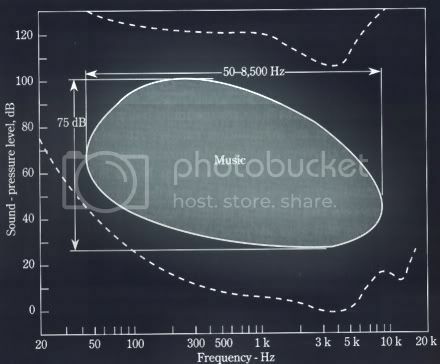 When I examined the speaker arrangement, acoustic conditions, and general equipment used with many of those speaker evaluations, it became very clear as to why the majority of these negative conditions prevailed. 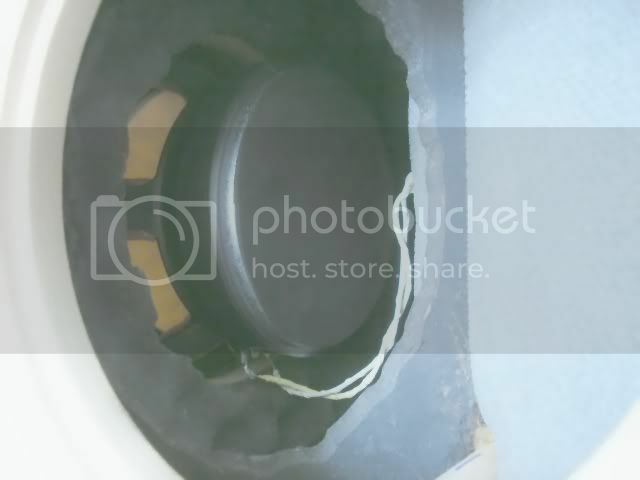 Unfortunately, it seems to be easier for the typical person to point blame upon the speaker rather than the actual problem which renders the speakers performance substandard in their specific application. 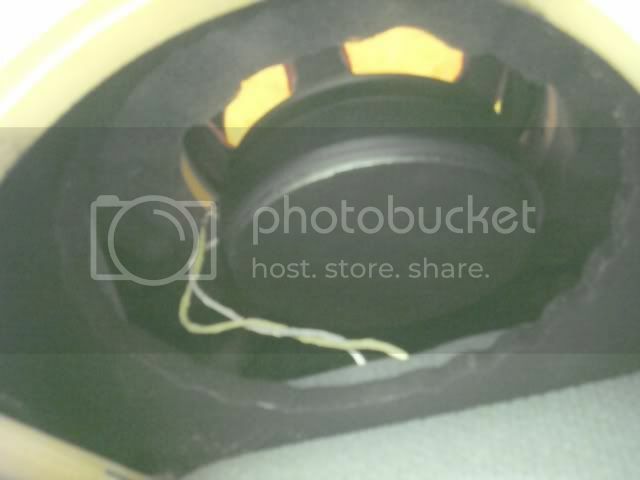 I really find it to be laughable when critical factors such as these are neglected from an individual who insists that something is bad with a speaker or component in general, when the true cause is clearly revealed elsewhere (usually in set-up/acoustical factors), but somehow evades sensibility from that individual. Arguing with someone in this state of mind is like trying to teach Quantum-Physics to a monkey after years of prolonged exposure to mind altering chemicals. The difference has to be experienced by them before the light comes on with any substantial reinforcement as to it‘s credibility. Chances are that this individual will never resolve the actual problem, but instead choose to find some other addition in order to pacify the existing degree of unfavorable factors within the listening environment, since they obviously do not truly understand the underlying condition of the problem within itself. This occurs quite often as I’ve seen many examples to suggest this with what I’ve observed in the past. Putting a band-aid over a cancerous growth will not stop the spread of the deadly cell mutation. I have a good bit of experience with the NFX models using the very same drivers that are in the modified HDT models. Considering that all influenced factors between these model evaluations have been regulated within identical parameters, I can fairly surmise a reasonably correct affirmation of their differences. For myself to grade the merits of a speaker design, the speaker needs to be considered from all aspects which constitute the desirable traits associated with musical transformation inherent of naturalistic form. The speaker must present a completely coherent and natural degree of embodiment which flows seamlessly across the entire spectrum without a hint of departure. I expect to hear sound with realistic dimensional cues as I would in real time within my natural environment. In order for this level of coherency to unravel within these perceived coordinates, it is only fair to insure that the rooms acoustical value is of prime setting. No speaker in the world is going to reveal it’s true worth if not presented in an ideal environment for which it becomes possible to disclose that worth to the maximum degree. 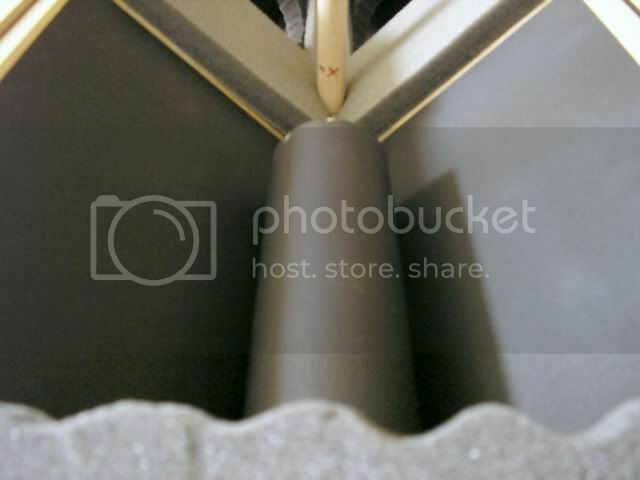 I have found generally as the rule, a design based upon a single full-range driver placed within a well designed T-line structure or that of a folded horn technique with the proper degree of coupling, free from any form of crossover network, is the basis for ideal and optimal results. I am so sure of this, that this is the only direction for which I will focus my future design concepts. The magic lies within the cabinet design itself for which the driver simply becomes the focal point for that magic to work it‘s wonder. The surrounding room elements are responsible for the complete transformation in which the speaker is portrayed within those elements. To have the ultimate sounding speaker is an impossibility without the reinforced structure for which to present the very basis for ultimate sound reproduction. I evaluated the NFX designs within two different acoustical situations with rooms of different sizes. What I concluded for which I had anticipated, was that these provide much better results within a larger room for which plenty of space is allowed around and between the speakers. When this is done along with adequate acoustical control measures, the NFX concept becomes one of the most openly sounding, transparently coherent speakers that one could experience above 50 Hz. It is my experience that the set of HDT’s that I built are even better, with a more articulated in- depth presentation of the midrange. From 50 Hz on up, the NFX speakers generally comply with my expectations to where they are quite respectable in the manner for which they interact with the surrounding elements. Dimensional placement with widespread spatial properties is the strongpoint for which these designs excel in form. A positive trait of equal magnitude must be attributed to the coherency factor for which the mid range and higher frequency qualities are of exceptional clarity when the DFR-8 driver is employed within this design. This is another example of a single full range driver concept, free from any crossover network introduced within it’s path. 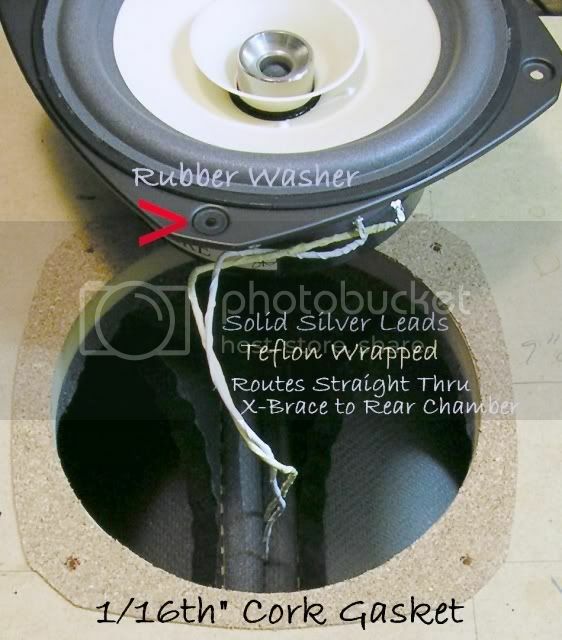 The main factors which influence this speakers sound quality outside of the driver itself, is contributed almost exclusively by the surrounding elements and the speaker structure itself. The NFX speakers must be placed in large wide open spaces with plenty of room to breath. Otherwise they will gasp for air and the result will be suffocation in a smaller room. If there ever proved to be a speaker which is totally room dependent for it’s perceived response, this one ranks near the top of the list, with the results clearly expressed. In either case, the fact remains that this design stops cold below 50 Hz! 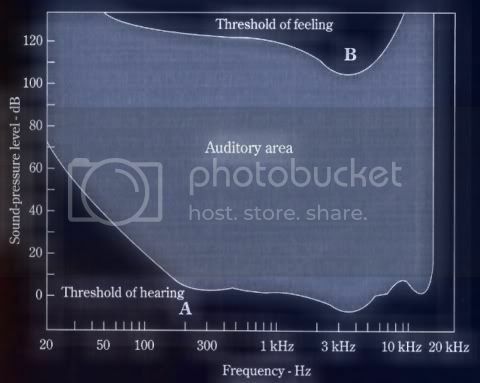 That may not be an issue for some, but real life sound fluctuations are not limited to 50 Hz, therefore the NFX speakers are incapable of reproducing the full spectrum of sound for which is audible within human response. There is a great deal of critical information embedded within the lower frequency elements of music, extending far below the limited range of the NFX designs. Therefore, as a stand alone speaker, these have failed to meet my requirements due to this factor. They do many things right within the appropriate surroundings, for which many people would find to be quite satisfactory within their expectations of musical range. For the rest of us which consider the lower frequency range as a very critical and important function for presenting musical accuracy and presence, this is something that is not optional as a compromise. The DFR-8 driver placed within the modified HDT design, upgraded with the advanced tuning procedures, shows just how special this driver really is. Not only does the low end extension prove to have a very strong, detailed response that fills in the huge gap left by the NFX design from 50 Hz down, but the tonal distinction and presence within the midrange proves to have an enriched flavor and texture better suited for a palette of complex accuracy. It is a matter of certain elements for which this particular HDT build excels from one aspect over another. This is one of those rare designs which stands up and defies you to find fault within it. 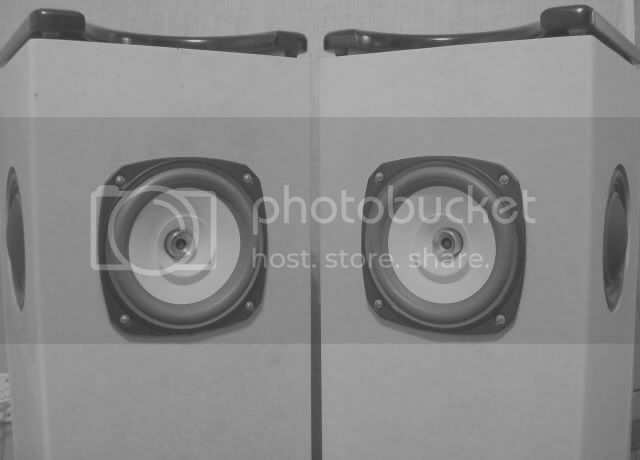 Any fault that is falsely perceived from this design can, and will, be most assuredly traced to external factors outside of the speaker itself. This is not much different than when we base known principals within projected goals of performance gain from automotive engine design. If one is to design a car within specific performance guidelines, then it is necessary to plug in the numbers in order to calculate a reasonable approach for attaining this projected goal. It all hinges upon power transfer, weight, balance, gear ratios, fuel quality and efficiency. The final objective resides within knowing how to bring all of these factors together in prime form. None of this matters if the driver is not in sync with the mechanical aspect. Power means nothing if not harnessed correctly. Thanks. I too wish I had pursued this design concept many years ago. If I had known then what I know now (hindsight is truly 20/20), things would have been much different in pursuit of my design goals. I actually started the HDT project over three years ago with the intention of building the MK2’s. I became sidetracked with much more important issues which put this project away for some time. The funny thing is that I’ve had all the parts necessary to build two complete sets of HDT’s for quite some time. When Bob Z. moved away from Phoenix back to the east coast, he basically donated enough spare pre-cut parts from MDF to assemble the set shown here. I took a lot of stuff off his hands to help him make his transition, with these parts being an added bonus. Bob also set me up with the passives which I am grateful for. I already had the drivers which were installed in the NFX designs. Finally, not like I needed to have another set of speakers taking up space, curiosity got the best of me for which I pulled the parts out of storage and the rest is history. Turned out to be the best speakers which ever graced my audio system! These were the speakers which held the key to providing me with what I desired in a speaker’s presentation all along. Imagine having the answer to your needs in front of you all this time, and never letting it reveal itself. This is what happens when things are allowed to be put off. 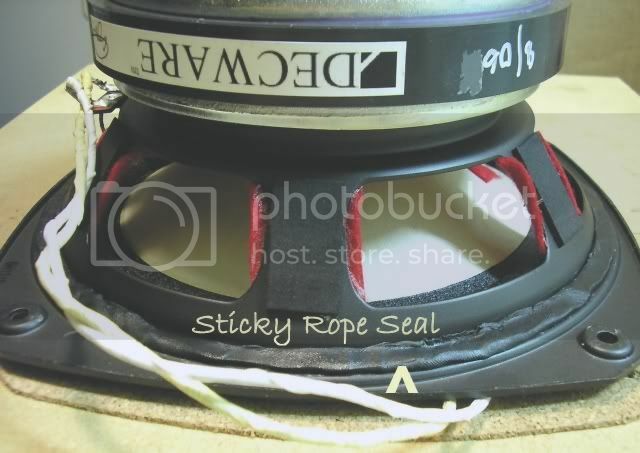 I find it interesting that Steve’s original speaker design has proven to be the ultimate single driver ‘stand-alone’ concept for which still stands as the elite design that others strive to match. Perhaps the only contender to exceed it’s potential (let alone even matching) being that of the Imperials when overall performance parameters are considered in the complete scheme of musical presentation. When one balances the weight and size factors which separate these two radically different designs, both of which provide reference quality sound character to the ultimate degree, the modified HDT would still be at the top of the list when the elements of weight, size, cost, and efficiency are brought into play where ‘performance-to-size’ ratio‘s are the determining factors by scale. With that being said, by proportional measures, I would be hard pressed to believe that any speaker with the volume displacement of the HDT structure could even come close to the complete presentation which these so effortlessly convey with absolute authority. That presentation hinges upon a seamless, and utterly transparent focus which spans ideally from 20 Hz to 20 kHz in a stand-alone configuration with an ideally flat frequency correlation across the entire spectrum. It would be very difficult for any speaker to surpass what this model does in this regard, let alone the aspects of efficiency, speed, definition, timbre, and the overall culmination for which three dimensional presence prevails in such a dominating manner. The Imperials will of course dominate by shear size in a larger room which would warrant such a design to couple with the surrounding elements more effectively. In a typical room of moderate proportions however, the Imperials would be too large and counter productive just as the HDT’s would not be able to provide the same level of influence in a large space to compete with the much larger Imperials for which they are a better match to scale. It is on my list of future things to build for which a set of Imperials (or at least the sub-only versions) will be added to my dedicated custom audio room. There needs to be more updated information on the forum board concerning appropriate driver matching for these cabinets before I make the commitment to pursue that build. At this time, that would be the only build which fosters any real excitement within me for which I feel would go beyond the HDT experience. 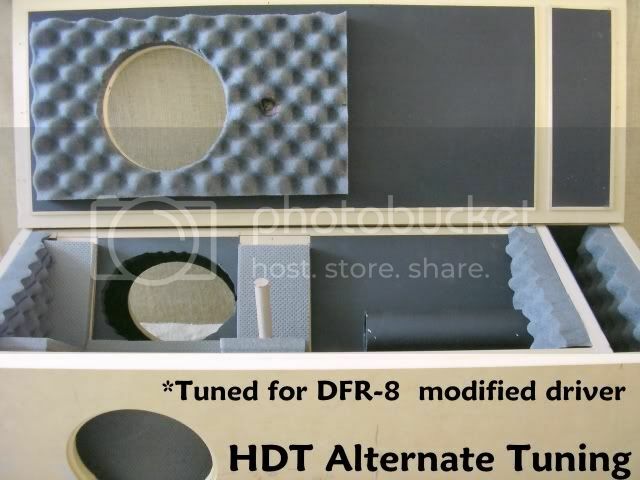 There are many folded horn concepts which capture my attention with great potential by design, although I am not convinced that any of them can outperform or even come within range of the rated performance standard for which the current modified DFR-8 HDT holds with such firm integrity. I will of course push the limits of any design with a fair objective toward testing parameters. In the end, accuracy will be displayed through the test results as well as controlled listening evaluations to confirm the conclusion. 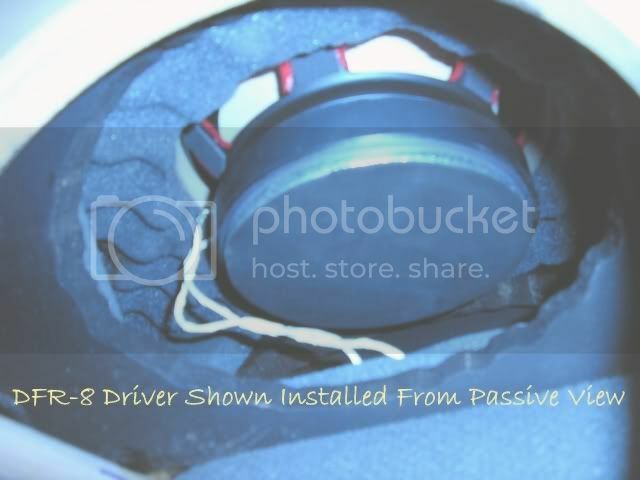 I have contemplated a couple of back loaded designs based upon the Fostex drivers. My goal is to experiment with different designs as a learning objective for what each holds in perspective. The culmination of positive attributes would then be the basis for which new design possibilities may be introduced from and expanded upon. The secret lies within the control of cabinet resonance and wave distribution for which any possible improvement might be extracted. This means extensive prototype builds from different material formulations with some sort of adjustable tuning in which to extract any hidden potential or expose new techniques that usually arise from experimentation.. The present designs represent the best of what has been developed to date. That does however leave room for further advancement within any design if one is willing to pursue a logical approach beyond the tested parameters of the current envelope. 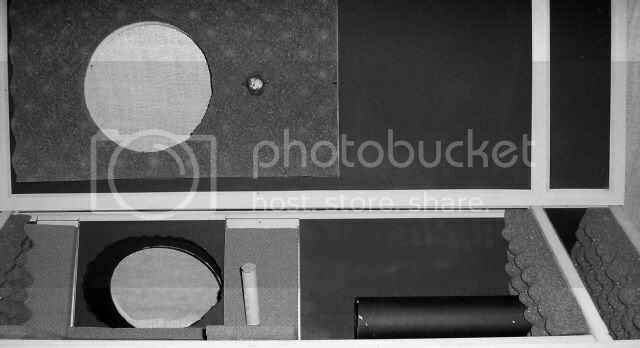 One does not know what lies in waiting outside of the box until the lid is blown off to explore the outer elements. We must never forget that the design process simply does not end with the speaker itself, as the surrounding elements are actually the greatest extension of the speaker’s potential for which all elements must communicate in an efficient and positive manner for the end result to hold any tangible structure within it’s focused objective. What you do to focus the sound outside of the box will be your greatest and most complicated task for which ultimately exposes the nature of projected sound within those elements. The level of speaker enhancement is only as relevant as the quality of it’s highly influential surroundings. I wouldn’t expect to have positive test results for evaluating high speed tires on a rough gravel road full of ruts. I would however, fully expect with extreme confidence to acquire ideal testing parameters for my goal upon Germany’s Autobahn as the testing ground for which the finely tuned suspension can interact optimally with the surface for which it corresponds. Acoustics are relative to these extremes being just as conducive to the actual outcome. There is always room for advancement. We just have to follow that path until we have explored all that we can envision within our imagination and efforts. Your idea of a dampened ‘sandwich’ composite structure is the right approach to controlling resonance through stability. 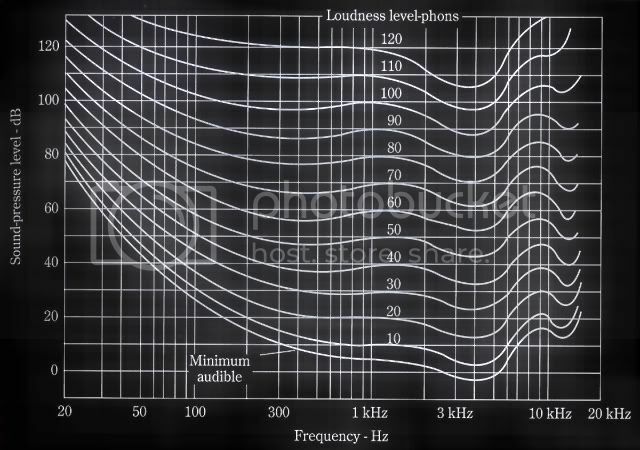 The type of material and the degree of isolation in correlation with it’s overall strength to mass ratio will indeed play a critical role in the overall sound of the speaker. This is no different than comparing the sound of a musical instruments body. A violin maker may have to create 100 violins using the same material and technique before he creates that one very special instrument that is totally unique and just exactly as he expects it to sound. Does he know what secret lies within this special instrument absent from the other 99 models it was patterned after? Most likely this evades him although the sound quality does not. It comes down to the resonance of the structure itself along with the added reinforcement of the special varnish applied to it’s surface. The chemical composition of the varnish itself plays a vital role in the final sound of the instrument. The same principal applies to what makes a great guitar sound so much better from another that looks virtually identical. It all comes down to material, technique, and structure for which to dial in that special sound quality. Resonance is the key to success with which you must fine tune to extract the optimal tonal balance. If the structure is rendered too dead with an excess of solid mass, the outcome will be perceived as so. You may have to try different techniques before you zone in on that special integration of material which meets the ultimate objective. It is a given that a solid MDF structure will have far different tonal qualities than that constructed from plywood. The structural integrity will be far greater with Russian grade Baltic Birch composite(13 thin layers) than that of inferior 5-ply material in common plywood. The resulting sound would reflect this to a large degree. Stiffness, density, and mass play the major elements for proper cabinet design. Plywood will produce a livelier sound than that of MDF. Whether or not this is to your advantage hinges upon the technique which it is employed within the construction phase. This can make all the difference as to how the midrange qualities are perceived as the tonal balance will be directly influenced by the composition. 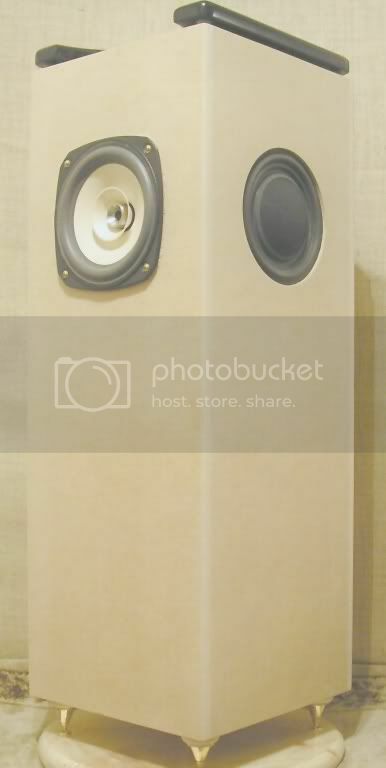 If you were to build the same speaker design with the only variance being that one is MDF versus the other made from Baltic Birch, it is assured that these two speakers will sound nothing alike. It may take a combination of MDF in key areas of isolation in conjunction with layered wood composite in other areas to find the appropriate balance. I have read reports of these comparisons where the builder proved the MDF to be sonically inert by comparison, while the Birch plywood provided just the right degree of tonal balance throughout the musical spectrum. I tend to believe that the much superior Baltic Birch would have a sonic advantage over the MDF in most cases. Baltic Birch will always be a better choice over standard plywood or particle board due to it’s multi-layer composition providing increased structural density. The only way to confirm this theory is by actual performance testing under strict guidelines. In the end, your ears will disclose the absolute truth. I would place my money on the composite material constructed with the highest degree of isolation and density. It is known that high grade Sitka Spruce provides some of the most ideal material for musical instruments due to it’s superior sound qualities. 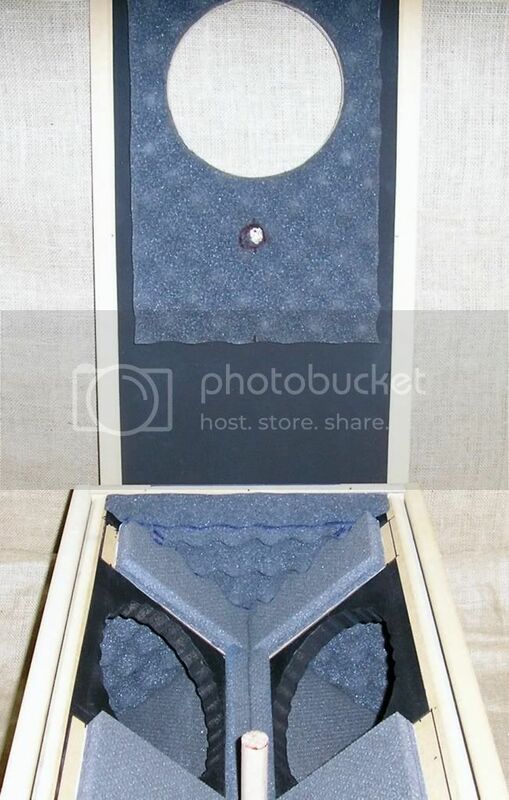 This material is hard to acquire and very expensive. Finely crafted musical instruments utilizing this material for the body will undoubtedly sound very special with a price tag reflecting it’s degree of quality. Could you imagine the construction of your speaker cabinets with an outer composite wall made from Baltic Birch with the inner surface constructed from the Sitka Spruce? I would imagine that this would have a very unique tonal quality to it that would be near to ideal. Still live enough to produce good harmonics while providing enough mass to keep things under control with the proper degree of tuning. If Sitka Spruce is favored for use in quality musical instruments for it’s tonal balance, then it stands to reason what it could do for the sound of speaker cabinets. I for one would like to try this as I am sure that there is something to it’s credibility. It would be very costly to take this approach but the end result could be vastly superior. I do know that the last thing that one wants is to render the cabinet so dead that it becomes completely inert. Too much mass can have a negative effect, while insufficient mass will be just as detrimental. You have to find the right balance between the two for which to find the right sound quality. Trial and error usually comes into play for which to determine this. This is one of the major aspects which separates exotic high-end speakers from the ordinary for which these are clearly superior by a vast degree. Concerning your idea of mass loaded isolation for the wall construction. I find this to be interesting with a great deal of potential. I do believe that the process should be reversed as the Bamboo plywood composite should face the inside of the cabinet for it’s tonal influence. You would want the high mass influence of the MDF to form the outer layers of the cabinet walls. A thin asphalt layer sandwiched between these materials could work very well in theory, but I am not sure how these panels would be effectively joined together with absolute integrity. You may have to use thin cork sheet as an alternative for the sandwich layer. That at least will provide a good adhesion surface for gluing the composite structure while still providing a high degree of isolation between the layers. Strong corrugated paper would also work as an alternative. You would then still have a nice outer surface with the MDF which can be painted or veneered. I would have to agree with you concerning the greater benefits of using the single driver approach, especially by using the incredibly superb DFR-8. Any time that elements such as separate components with the complications of crossover networks are removed, the sound quality is going to be in your favor due to less influence within the circuit to color the sound. I am absolutely amazed by how much presence there is in the lower registers with just this single driver coupled to this cabinet design. I would have never believed the low-end extension that these produce if I had not heard them myself. Simpler does in this case prove to be superior. It is the midrange qualities that crown this driver King as it’s greatest strength. I have yet to hear any speaker(with the possible exception of full range ribbon elements that are very close) that can produce such a smooth evenly balanced midrange on par with the DFR-8 in it’s size category. I am sure that after your drivers are modified, they will be very close and better than before. In the mean time, I am still working on the finishing touches for my other set of HDT’s which conform to the MK2 versions. These are special in design for which they are nothing like the single driver concept. The internal structure is constructed from high grade Baltic Birch composite, while the outer shell is constructed from real cherry veneered plywood with African Padouk hardwood accents. 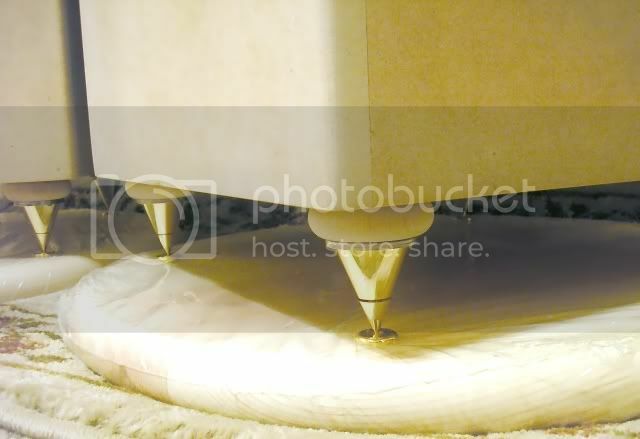 I custom designed the top structure with the top plate made from solid African Padouk and a custom housing developed from many complex pieces to form the ribbon element chamber which blends in with the surrounding top plates. 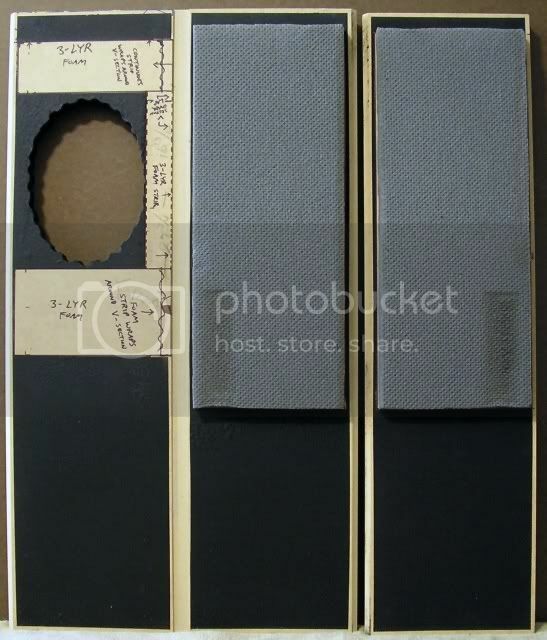 These speakers are totally unique aesthetically as will be seen when I post pictures of them when finished. After final sanding, all that remains is the application of hand rubbed oil to protect and bring out the natural beauty of the hardwood finish. These are far more complicated to build with far greater expense than the single driver designs made from MDF. These also present a far greater image of beauty and sophistication in appearance, but it is my belief that the single driver versions will dominate in sound quality factors overall. I will put that assumption on hold for now until actual listening tests have provided me ample time to confirm my speculation. I could be wrong and end up liking the MK2 version just as well. With what I’ve come to experience with the single driver versions, I doubt that there will be any surprises to upset the cart. We will see soon enough. I am quite certain that these speakers will have completely unique signatures in their sound quality. The proof is in the pudding! and the quest continues....but alas, i have so far been adequately convinced, that indeed, these speakers ARE capable of more than decent bass. the experiment was easy enough, since i have a threshold t50 amp. that is being used at present for a sub amp. so, out came the sv83s amps, and in went the solid state contender. yikes! what sibilence, but that is not what we are confirming here, so just grit your teeth, and listen to bass lines(where is that prozac bottle?). i will say that it also seems to enhance the midrange. now i know that i am on the right track, the sv83s mono's may be up for sale, and i will seek a se34I.2 or something similiar. again thanks for the info. also, i have begun to go for the alternative tuning, in as much as i have extended the port tubes, and have added most of the foam. 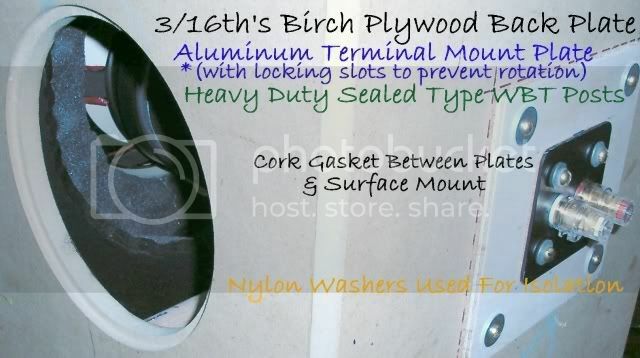 before i comment on that, it appears that, yes indeed it would be much easier to just start another pair of cabinets(the right way), or even consider buying the hdt cabs for sale on this site. either way, i have a much better bearing on the future path to 'the new sound' in my life. equally as mind bending to me is that as the drivers break in, there are changing variables entered, despite the fact that they are good,mostly, in nature. RFZ, thanks for your thoughts. I'll post some sketches on the assembly as I develop them later on. 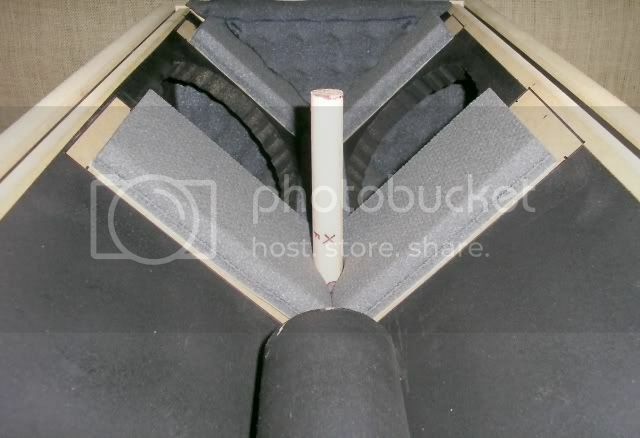 My theory about keeping the mdf core is that it is part of the dampening process, key for absorbing the higher back frequencies of the Fostex based driver, in concert with the foam lining for the Alternate Tuning. The plyboo on the outside is very dense and rigid, and I think will keep the panels from deflecting or resonating, and a material in between them will keep the plyboo from making the cabinet too 'live'. 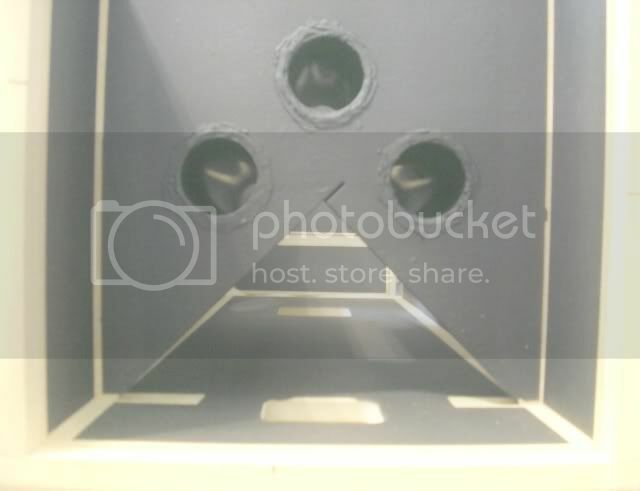 If I was building a set of Mk II's from scratch, I would want a more 'live' cabinet made from plywood, since its 8" drivers are so different in quality and range. Unlike the Alternate tuning, there is almost no foam or anti-reflective coatings in the Mk II according to my conversations w/ Zygi. Just a little bit shoved in above the driver, if any at all. The depth of detail, the speed of transient response, and the resulting pace and rhythm produced from these modified HDT’s as shown , easily sets a new standard which clearly surpasses the leading T-line designs. What is different about these HDTs than everyone elses? You got me interested again, if mine did thatI would start using them for something besides stands for other equiptment. …In order for this level of coherency to unravel within these perceived coordinates, it is only fair to insure that the rooms acoustical value is of prime setting. No speaker in the world is going to reveal it’s true worth if not presented in an ideal environment for which it becomes possible to disclose that worth to the maximum degree…. Yes, I found room treatment to make a bigger difference than speakers, amps, or any other item (as it should, it's a lot more work & time :) ) Hopefully the Teres will be the next big step up from the Dual/Rek-O-Kut. But back to speakers, and making HDTs usable. Exactly what are you referring to as "the HDT design once upgraded as shown in my build." Is that the longer tubes & different foam inside & different passives of the alternate tuning you're talking about, or is your upgraded build something else? How much longer are the tubes? Did I mess up by building mine out of Russian Baltic Birch instead of MDF maybe? And mine have been gathering dust since building the corner horns. I am going to attempt placing this into a new perspective for which may or may not narrow the gap between what is conveyed within. What is different about these HDTs than everyone else’s? What we really have to ask ourselves is this; why am I producing the sound quality that is on par with the designer’s results as opposed to feedback from the general masses indicating radical departure toward the opposite conclusion? There has to be something to all of this that would suggest a cornerstone leading to either a parable of sorts, or accuracy of technique to the contrary. I have adequately covered the reasons in lucid detail a number of times within the literature written. It is clear that I was not far off from center at all! I am not about to reiterate the scope of these facts as it is already held fast in written form. Please re-read my notes carefully, as there are many key points covered as to why general results are so randomly ill-perceived. Speakers of this caliber are ONLY for use within rooms that have undergone thorough acoustical modification, conforming to ideal properties as one key factor. Remember that surrounding elements play a vital role as to the actual outcome derived from the speakers themselves. I believe that your experiences with this have adequately solidified the importance of this issue within your thought process. You have indeed covered this aspect with good measure to the point where it should no longer be a detrimental factor. Precision placement with utmost accuracy is pivotal for these speakers within the room’s modal zones, for which to respond favorably. I can degrade the performance element of these speakers significantly, just by offsetting a few degrees from premium placement. If one keeps the interaction of key elements within check throughout the entire set-up procedure, positive results are predictably assured in the end. I spent several hours focusing on this placement using repetitive procedures through trial and error, which finally divulged the proper degree of placement within the room’s coordinates, and my listening position. This procedure is tedious but necessary if you want to attain maximum performance. Without going through the motions, the odds of extracting quality performance from these models (or any other speaker) are not in you favor. It will take effort on your part to extract the performance hidden within. Once you have discovered the benefits of this process, you will most assuredly concur with my findings. I strongly suggest following my set-up procedures to the utmost detail so that at least we have a proper foundation established as a baseline representation. (The link is posted above, found in the room acoustics forum.) Getting the rooms acoustical value within proper perspective will prove to be the missing link. Together, these factors will reinforce the speakers performance in complementary fashion for which the truth will be ultimately revealed with total adornment. I understand and appreciate the efforts which you have taken to transform your room within these ideal parameters. I also will be first to give high praise for the quality of your electrical power source. This establishes that your room is of great potential for which should be quite satisfactory for optimal results. The only thing left to consider is component matching and speaker geometry in relation with the rooms interactive properties. The source itself remains as the most critical element for which the impending results will be a core derivative. The amplification factor comes in as a strong second with just as much relevance to the perceived outcome. I have surmised that it is best to categorize these ultra revealing speakers as ‘analog-dependent’ for which to extract the true potential to be gained from this speaker design. 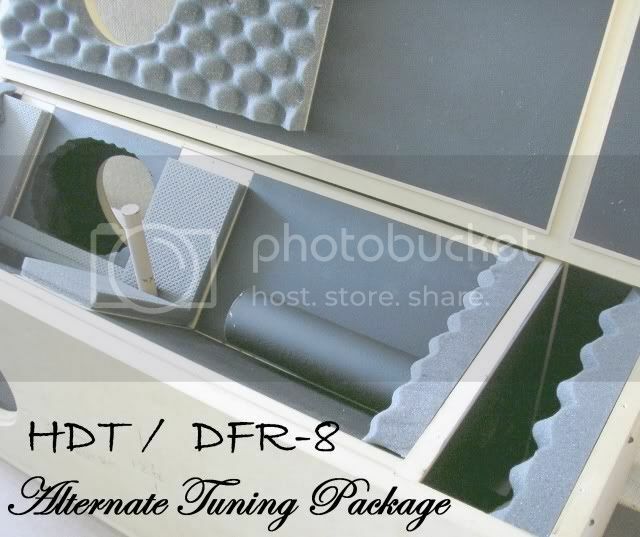 The DFR-8 based HDT with alternate tuning will absolutely flush out the best of the best or the worst of the worst within the system. As I have stated, there is no forgiveness on this level. This is the line in the sand where crossing it leads to either positive revelation in audio quality, or contrarily, the devastation of perceived sound. If the source is not within compliance, all other aspects of the system will be rendered irrelevant. A digital source (or any source in general) will reveal all it’s faults to the maximum degree with these speakers. Couple that with the influence of mediocre solid state amplification, and the end result is something that I wouldn’t wish on my worst enemy. The same applies for mediocre analog, although the degree of degradation is likely to be greater with digital anomalies exposed. It is of high probability that the outcome will generally be less than satisfactory. The best of digital source units will be of higher acceptance toward compatibility. However, mutual compliance with these speakers will always be superior with a premium analog source. The level of outcome will always be relative to the level of input. 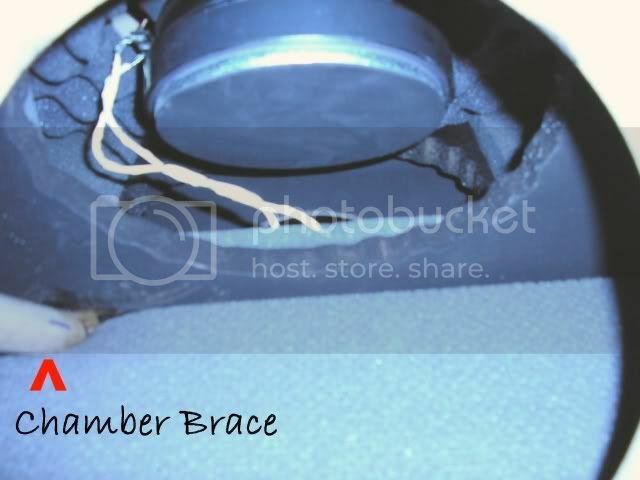 The other key element resides within the accuracy of matching parameters within the equipment in use with the speakers. As I have made clear, these models are too revealing and unforgiving for any condition less than optimal, as any abnormalities will definitely stand out with these speakers or any other design for that matter which conforms to this pinnacle of quality. Going back and reviewing my process, can you be certain that anyone else has duplicated my set exactly as shown in my process? I emphasized very strongly the importance of the seemingly small details that most people tend to overlook or disregard as non-essential to the outcome. That difference in detail is what sets apart any design standard from mediocre to within reach of the highest echelon of quality. To sum this up in undeniable conclusion, I do not have a problem with the results in my system/room configuration, nor does the designer in his. There is a reason for this outcome. We have conformed to the critical parameters which are essential for premium results. It is as simple as that! Do you suppose it is merely coincidence that my system in correlation with the room’s acoustical factors are virtually in sync with the basis for which the designer himself has within his boundaries? 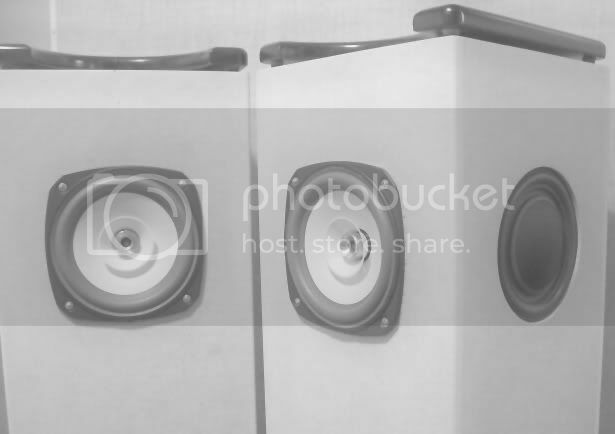 The same equipment with very similar room properties would strongly suggest as to why perhaps our understanding of these speakers runs analogous in form. In other words, we have assured an absolutely solid foundation for favorable results. It doesn’t become any clearer than that with any further extension of relevancy. Precisely my point! It is up to you for which to identify and eradicate the real underlying reason for which this statement is predicated upon. If you feel that there is a difference between a Mercedes and a Chevy, then this metaphorical example should present the general idea as to how much of a ‘step-up’ the Teres concept actually is. It is not a question as to whether or not the HDT’s are “usable”. Unless the integrity of the structural quality was breached, or something is amiss within the design implementation (non compliant within specification), the problem most assuredly stems from somewhere else. ‘Exactly what I am referring to’ is a degree of separation to preclude any doubt that absolute attention to detail with the highest preservation of quality, was instilled and solidified in accordance with my requirements. The general procedure is very close to the standard upgrade. My version of the upgrade contributed a few supplemental aspects which I feel are substantial enough to make a difference, as those ‘small’ details unify to sculpt the overall sound of the structure. Do not try to read between the lines here, as this is not meant to imply anything other than the fact that I can guarantee the quality of this particular build throughout the process, with the proper degree of modifications intact for maximum performance. My technical performance data clearly proves the credibility within. The results that I experience from this set of speakers would suggest that I am on the right track with my procedure. I will not argue the extent of difference induced. Rather, I will leave the fact where it remains, that these have proven to be the most refined, and accurate set of speakers across the musical spectrum that I’ve evaluated to this point. They are reference grade and a rarity of musical purity as far as I am concerned about them. My execution for foam requirements was somewhat different in both grade and placement. The tube length is per specification. However, I dampened the tubes to the point where their resonance factor was modified. I suspect that this if anything would lead to the most noticeable change in characteristics. The addition of structural chamber bracing is highly influential to the cabinets resonance factor. 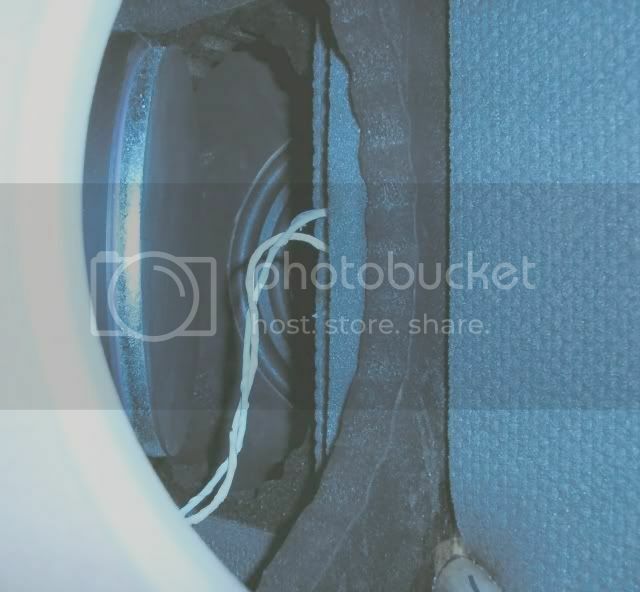 You may have noticed the dampening factor applied by use of the sound deadening application throughout the internal structure. I do not believe that anyone else has applied this tactic to these speakers, at least not to my knowledge. Again, this changes the resonant factor within the structure itself. Whenever this is done, there is ultimately going to be a change in sound presentation, affecting definition and tonal balance to some degree.